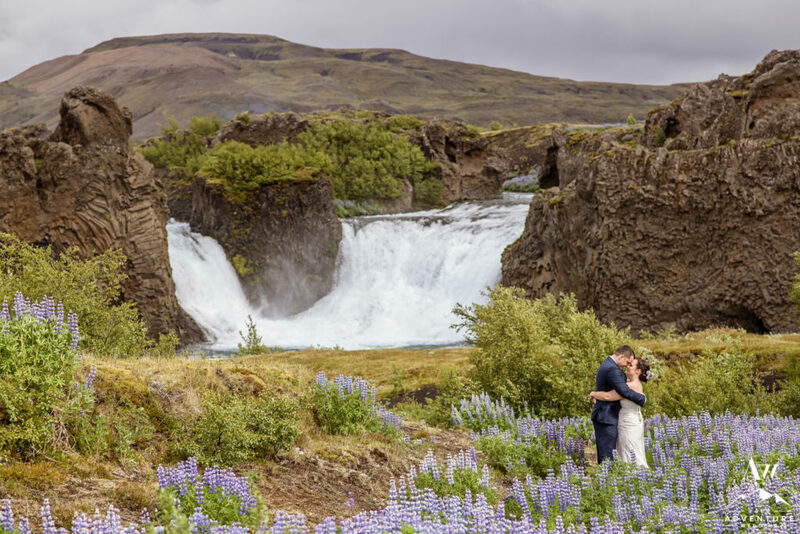 It’s the ultimate honor when a couple comes to us at Your Adventure Wedding curious not just about one location, but intrigued by two. 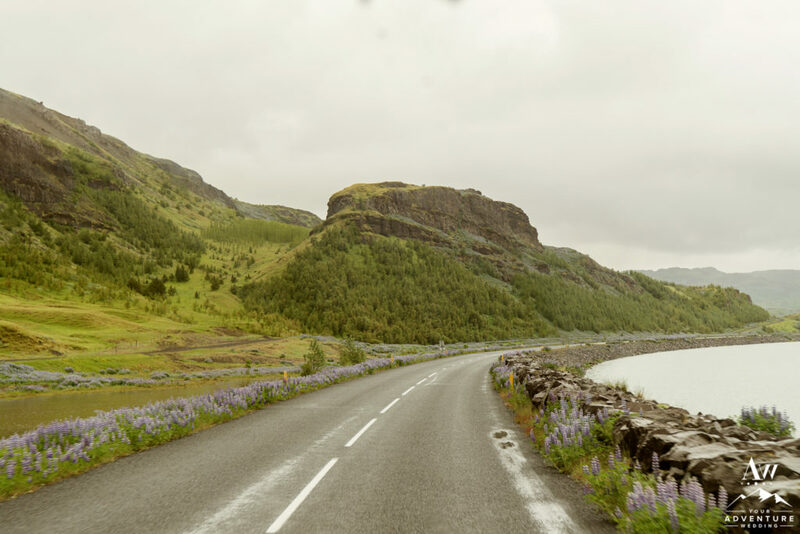 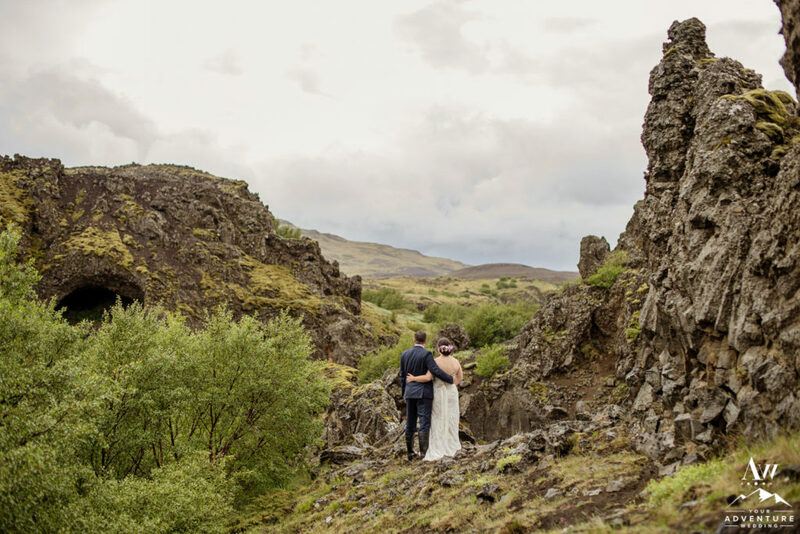 Rebecca and James were drawn to both Iceland and Scotland. 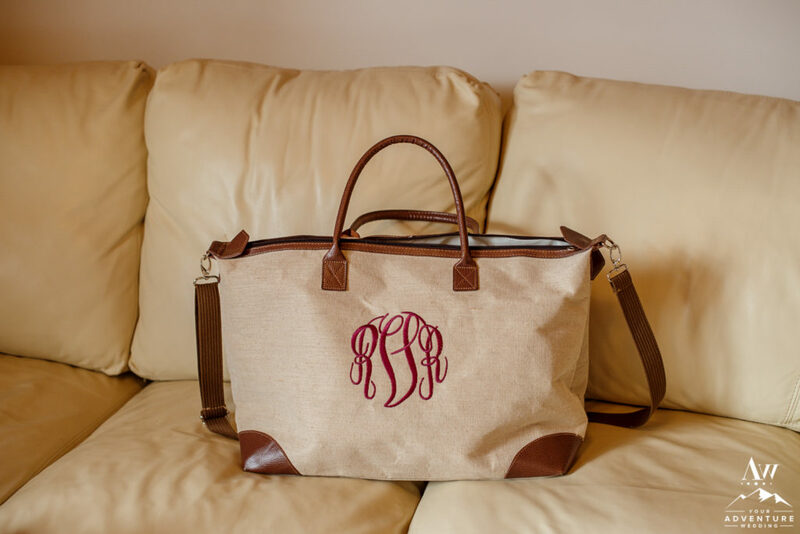 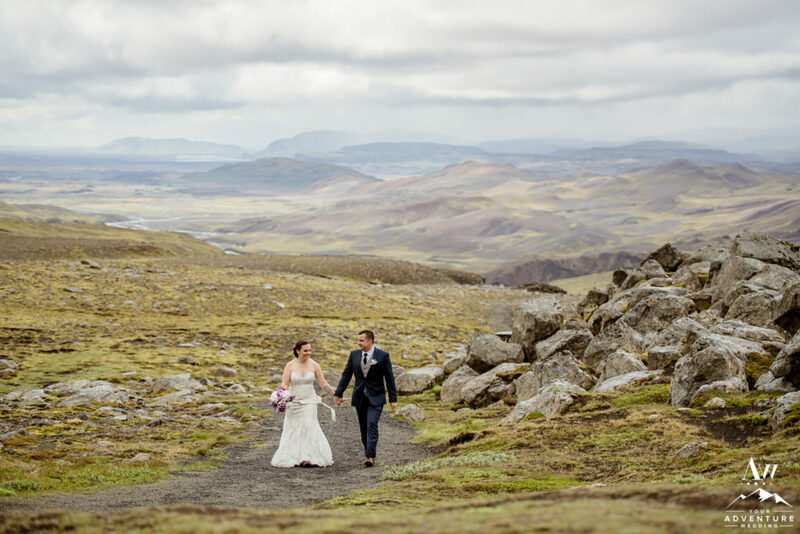 Their primary objective was to travel to a place neither they nor their guests had travelled to before. 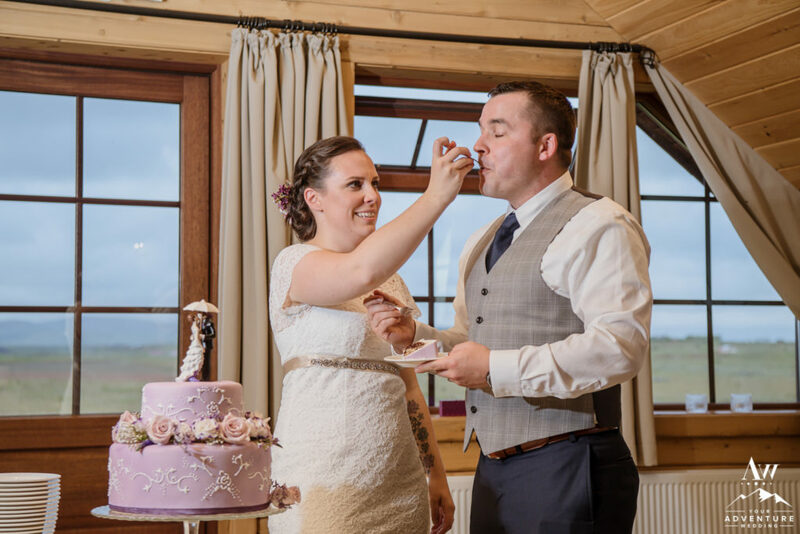 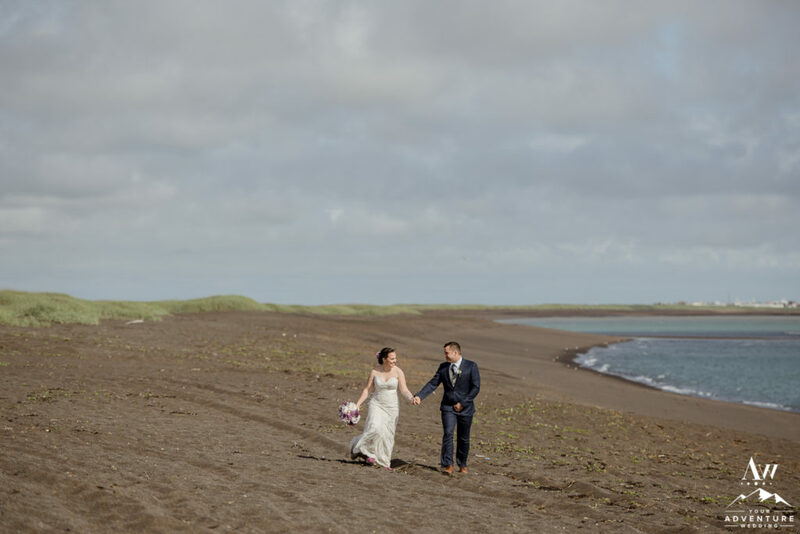 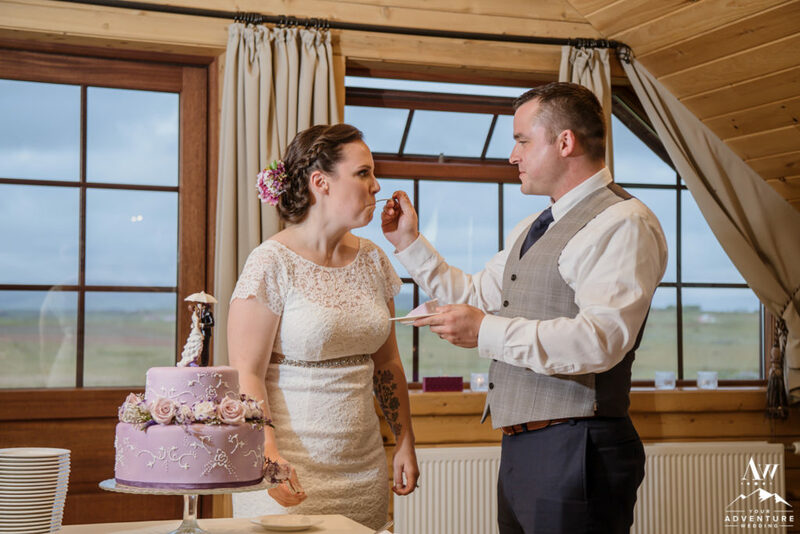 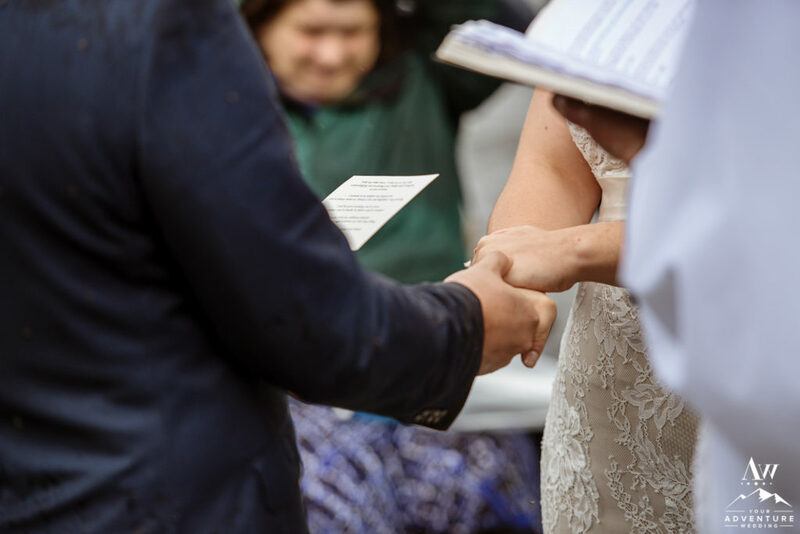 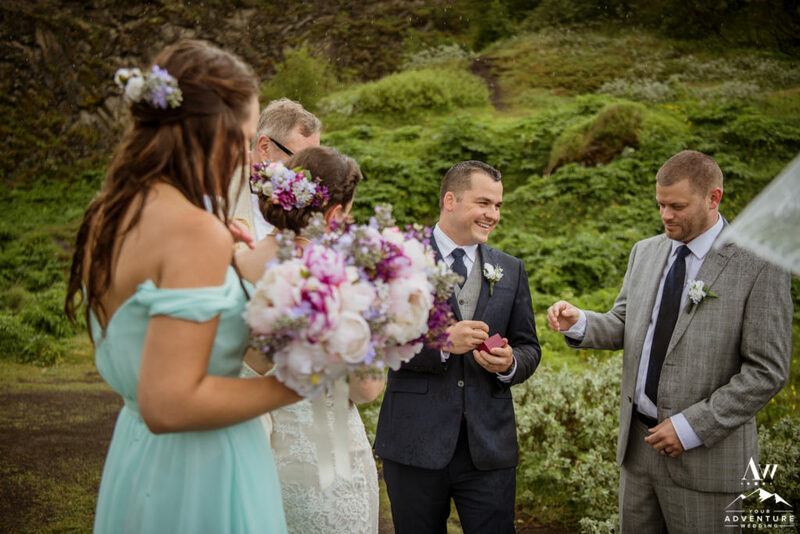 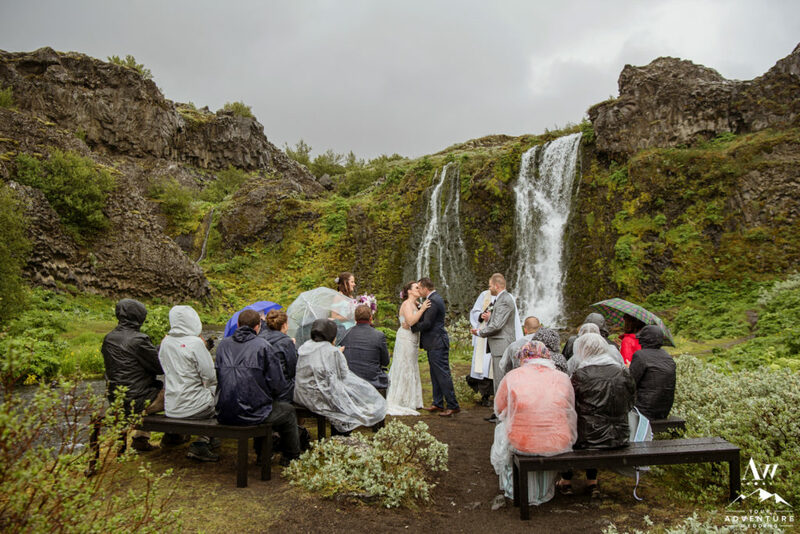 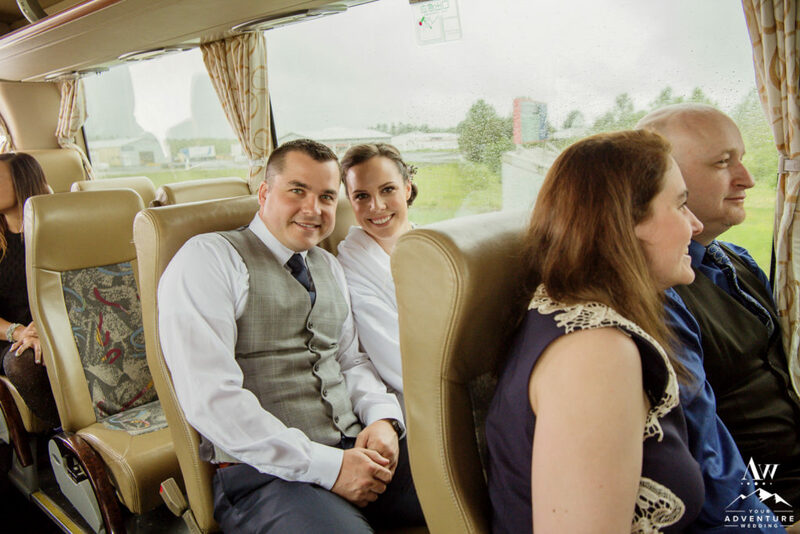 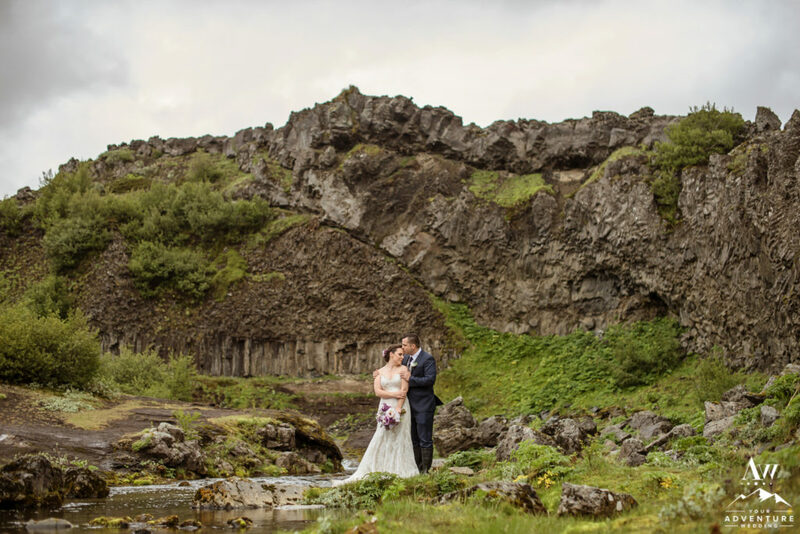 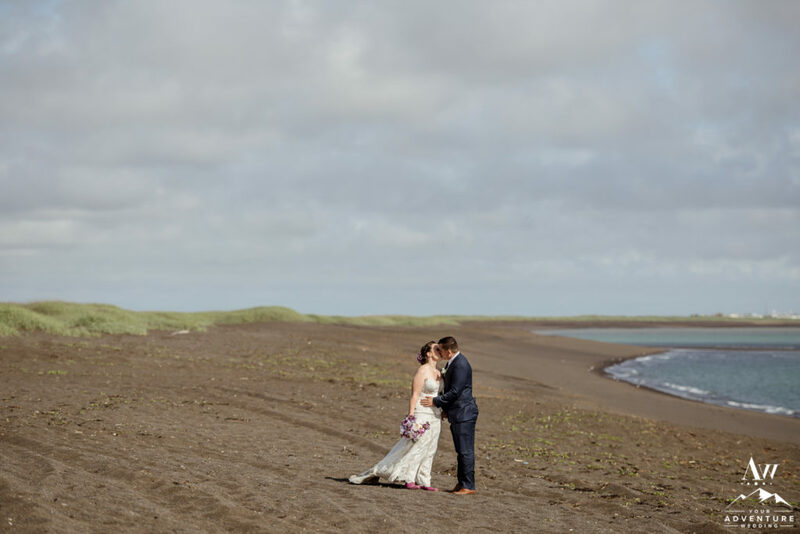 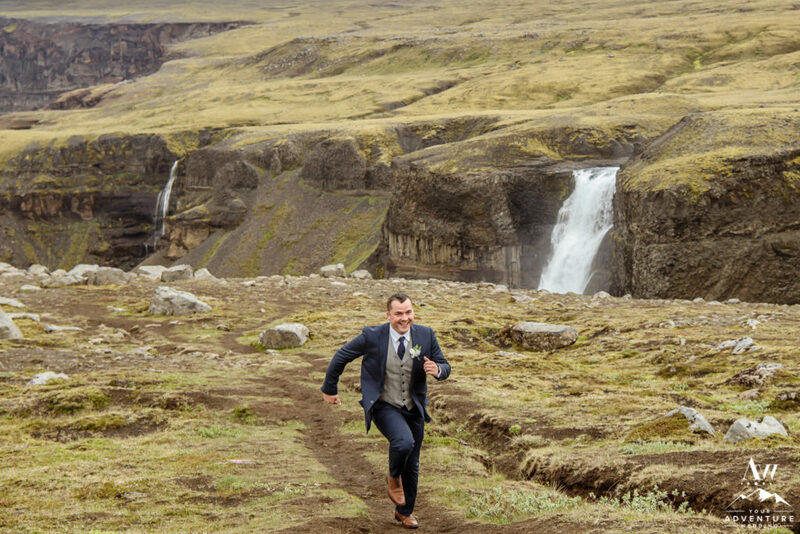 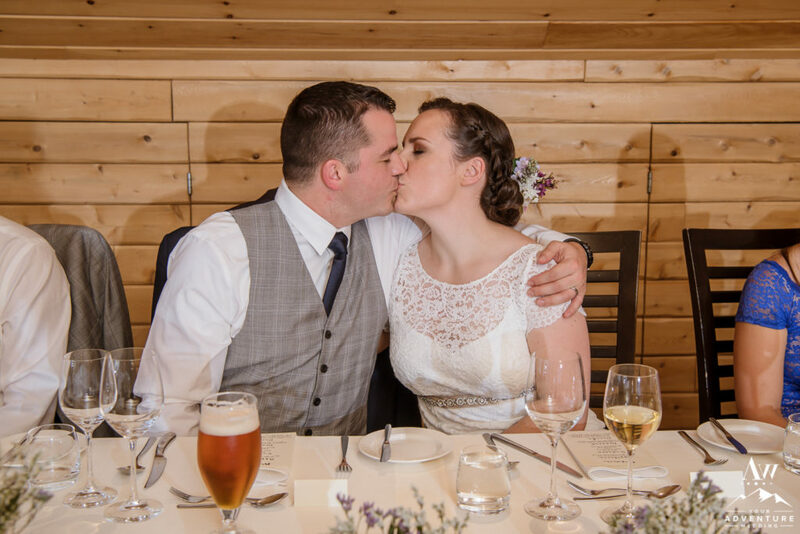 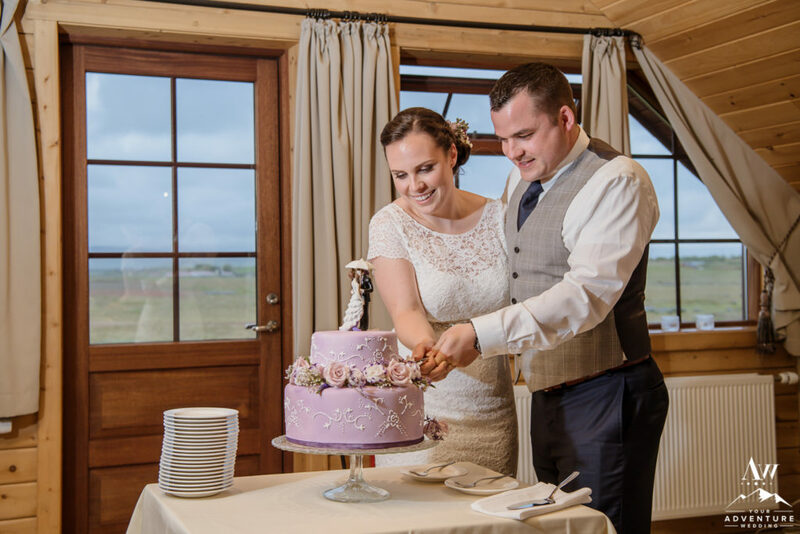 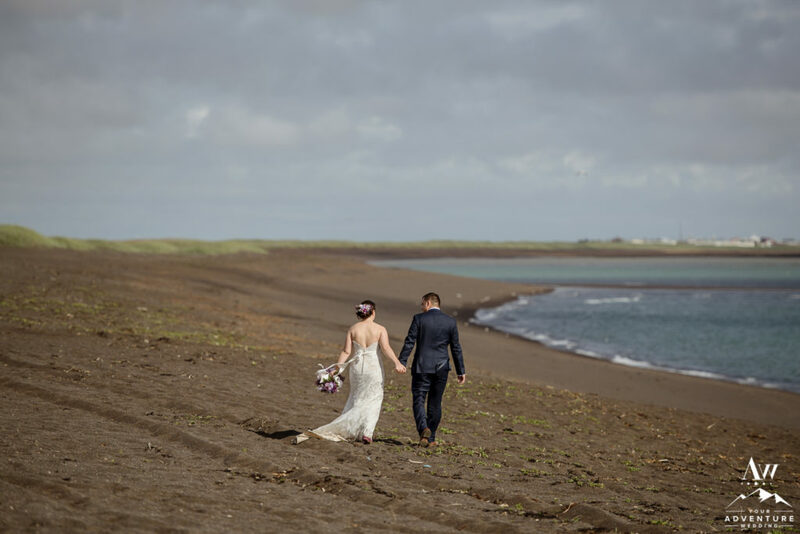 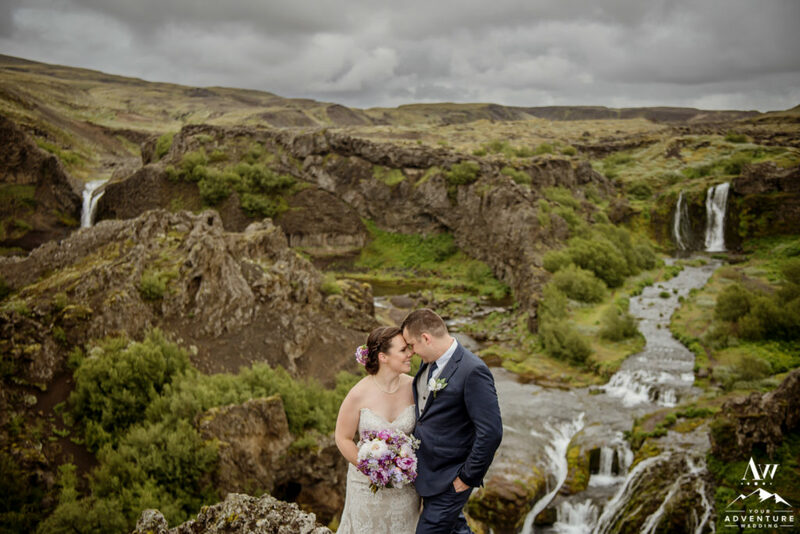 After hiring us to plan their adventure wedding and seeing all of the offbeat locations they could visit in both countries they in the end decided that having a wedding in Iceland was the most exciting option. 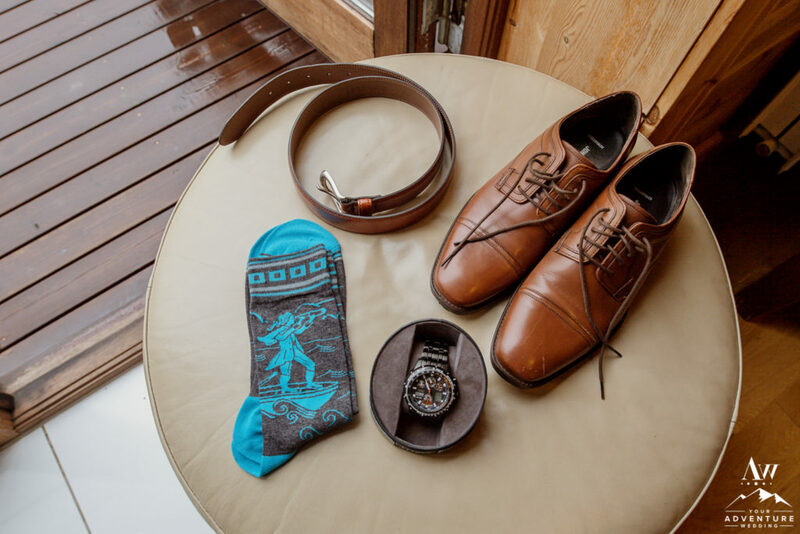 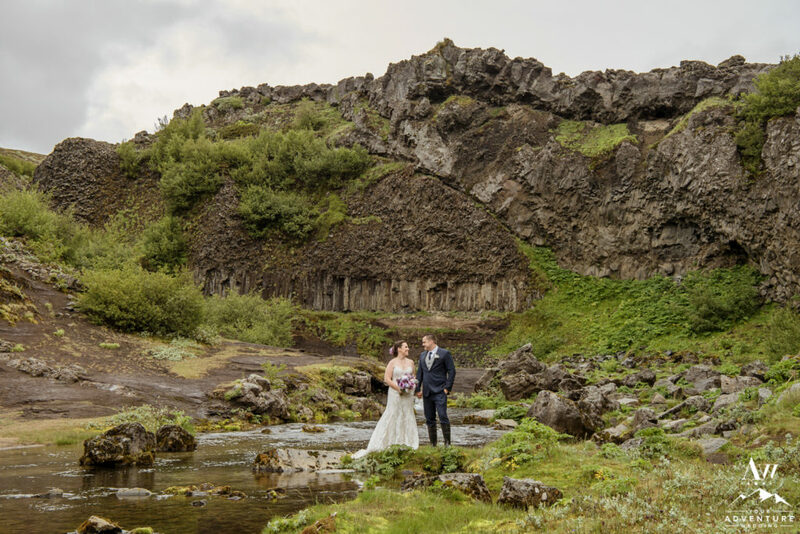 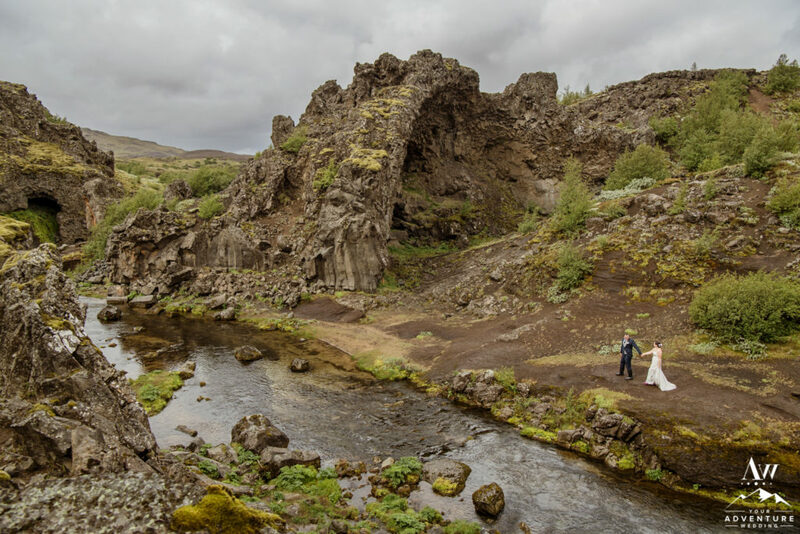 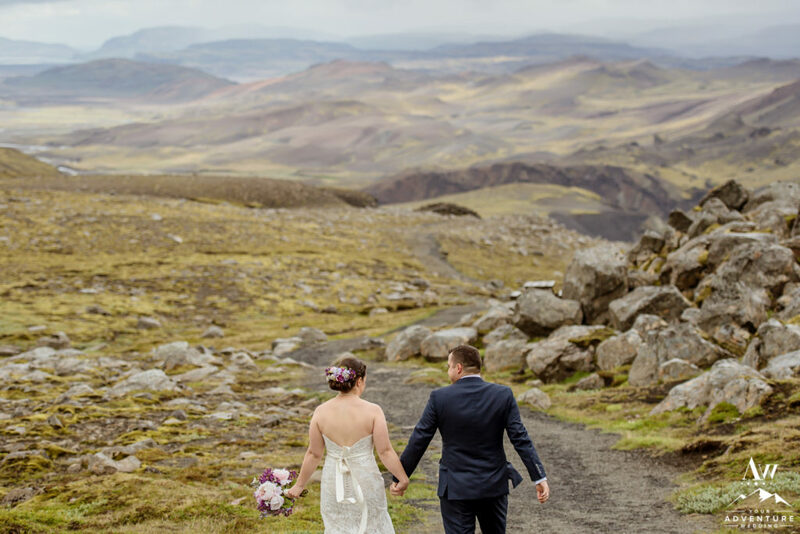 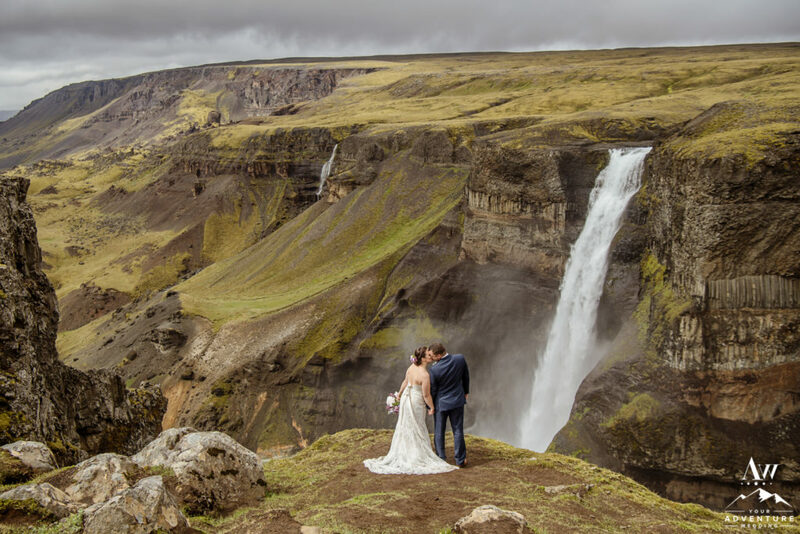 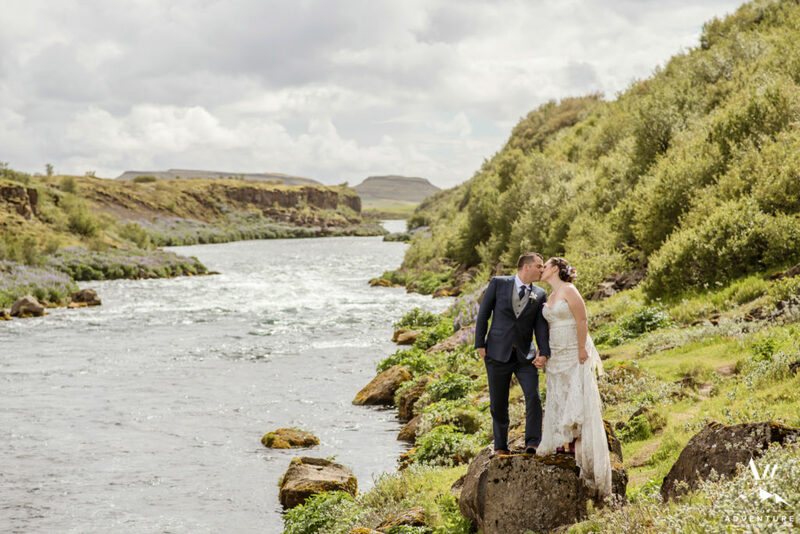 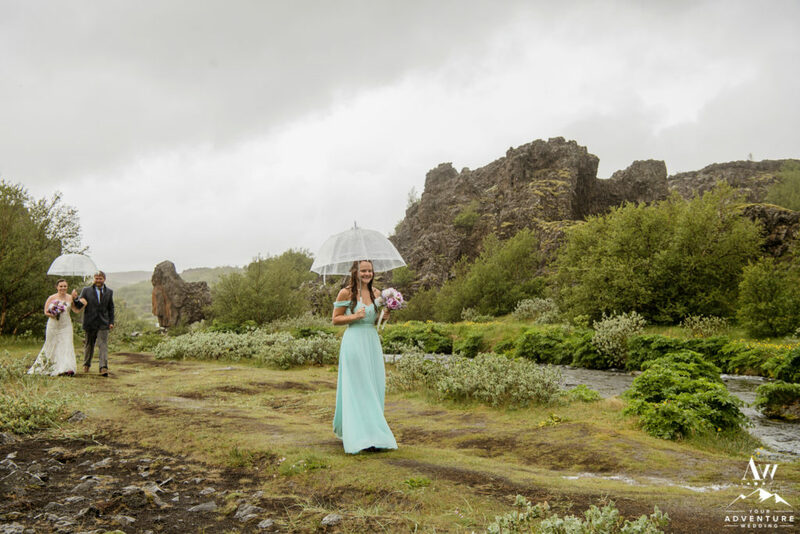 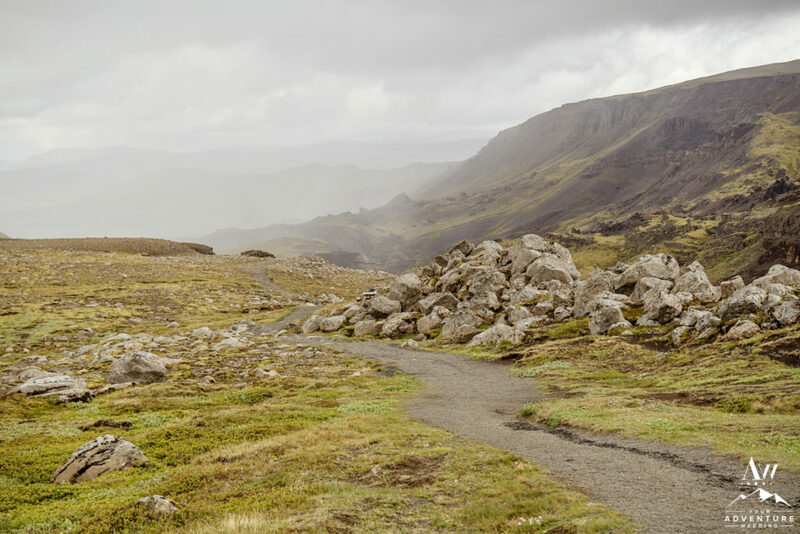 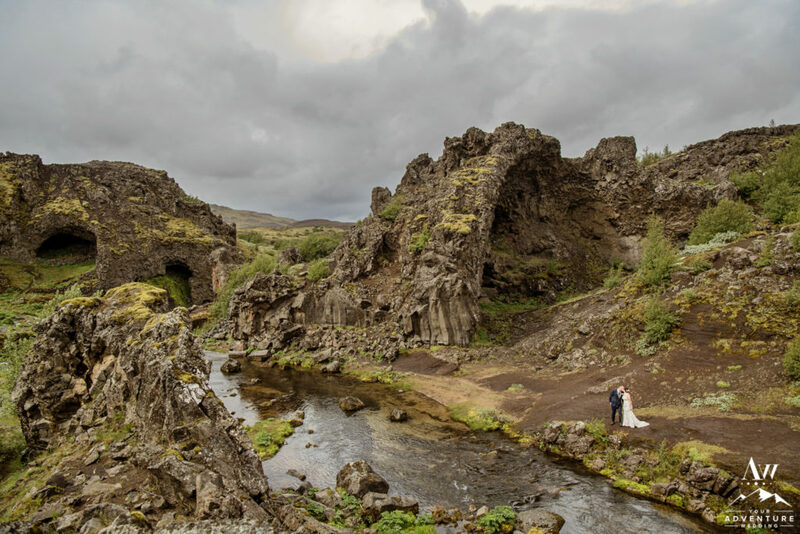 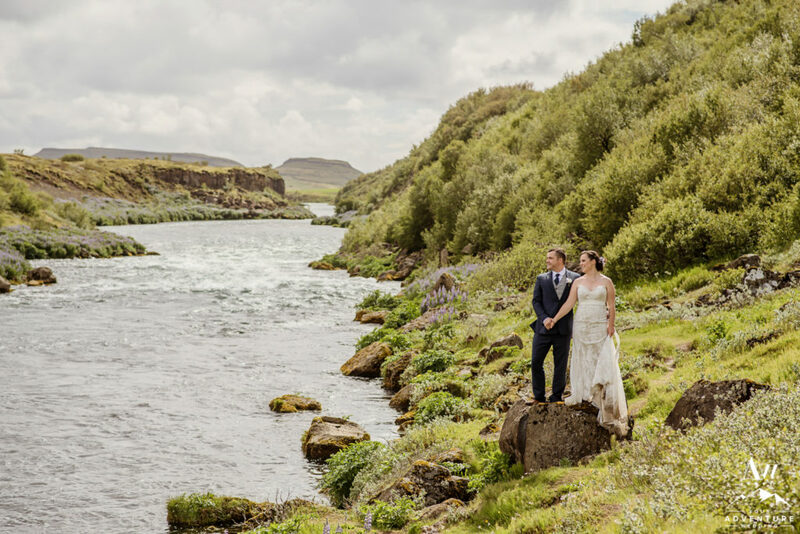 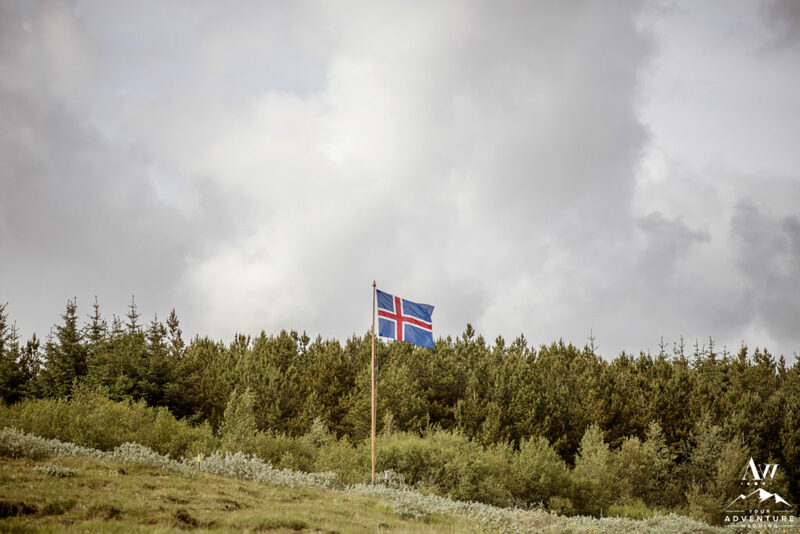 Being avid hikers, travellers, and after having an epic proposal at a castle on a mountain in Spain Rebecca and James, were ready to embark on a new journey of planning their unforgettable wedding day in Iceland. 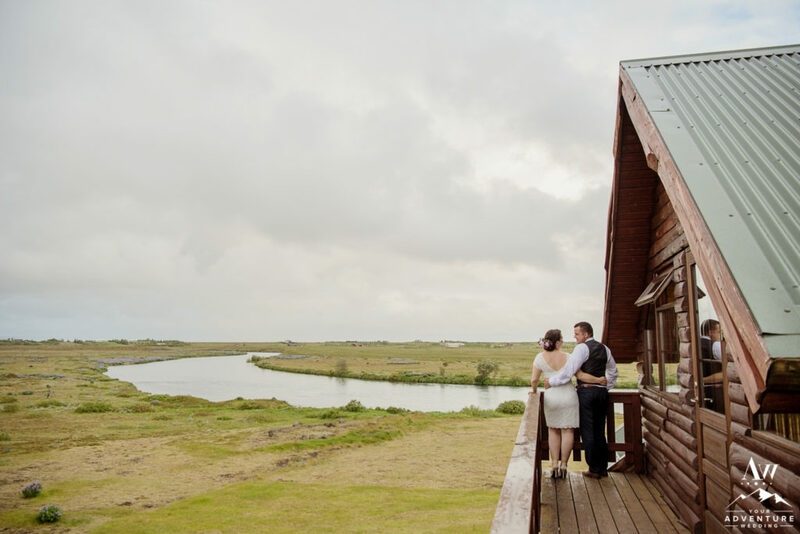 Hotel Ranga served as our fantastic ‘base camp’ for both the wedding welcome dinner and the reception after the adventure wedding day. 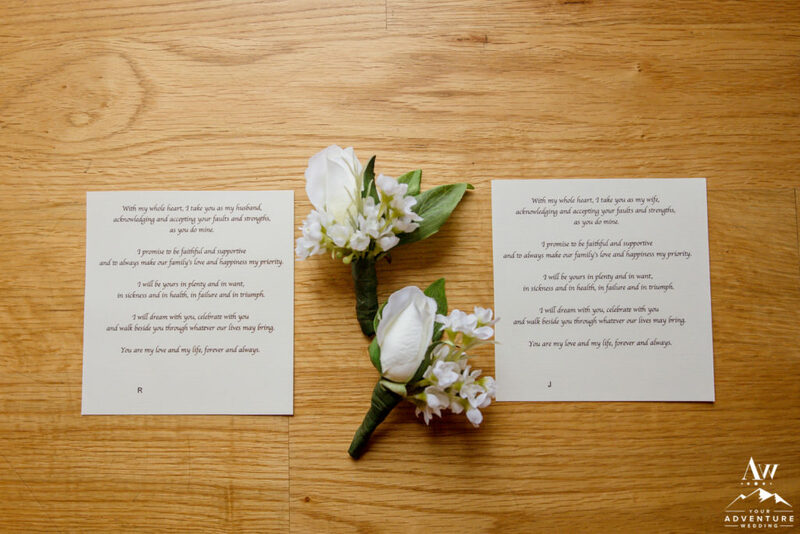 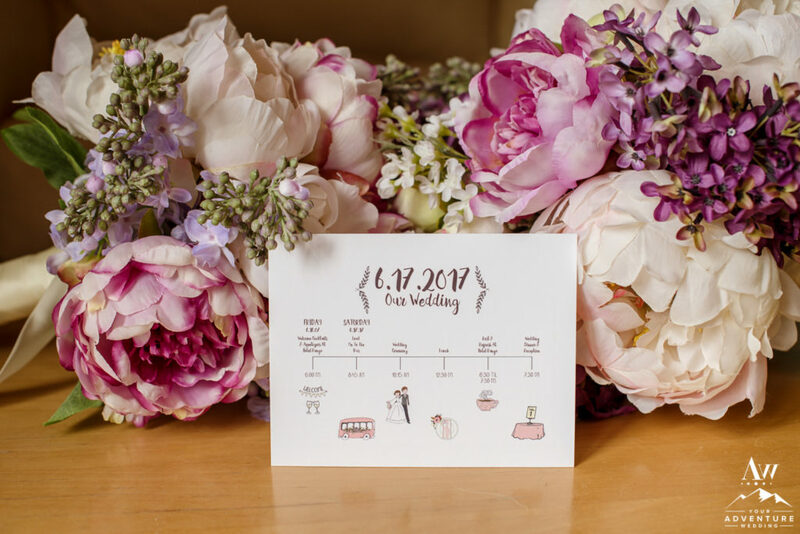 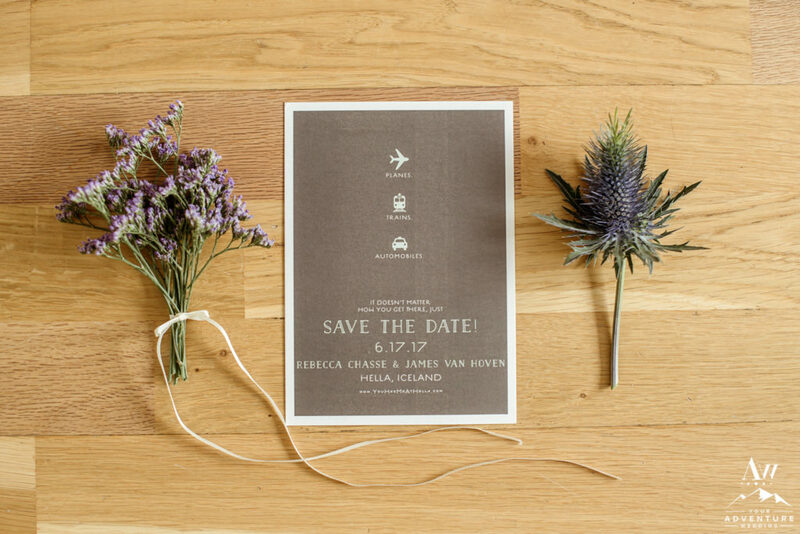 Rebecca and James had lovely Iceland wedding details such as timeline cards and wedding welcome bags (seriously, they had the coolest stuff in there!) 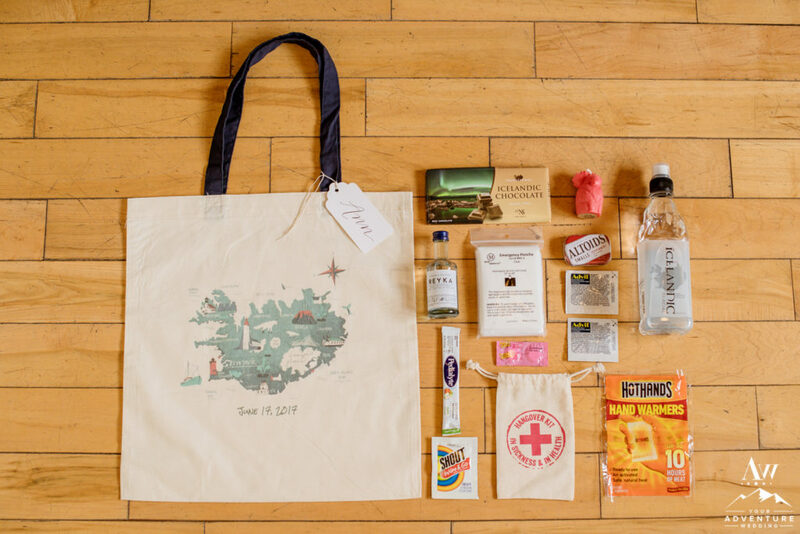 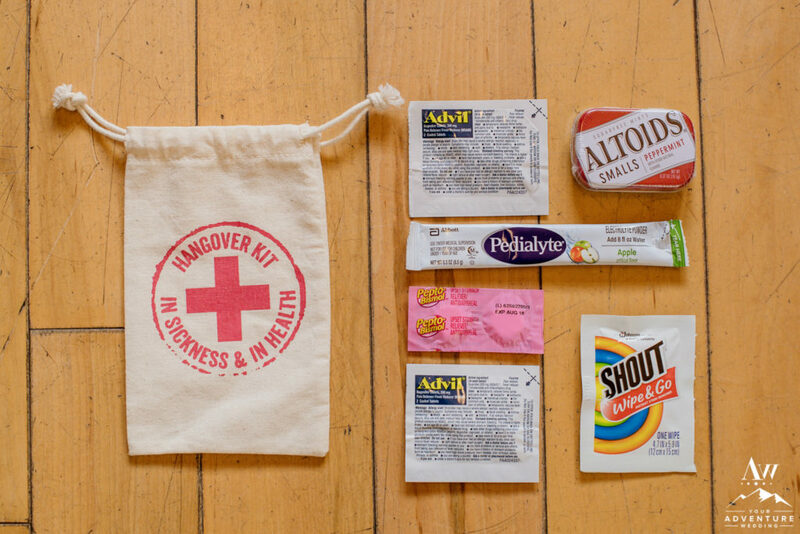 which even included a thoughtful “hangover kit” for their guests. 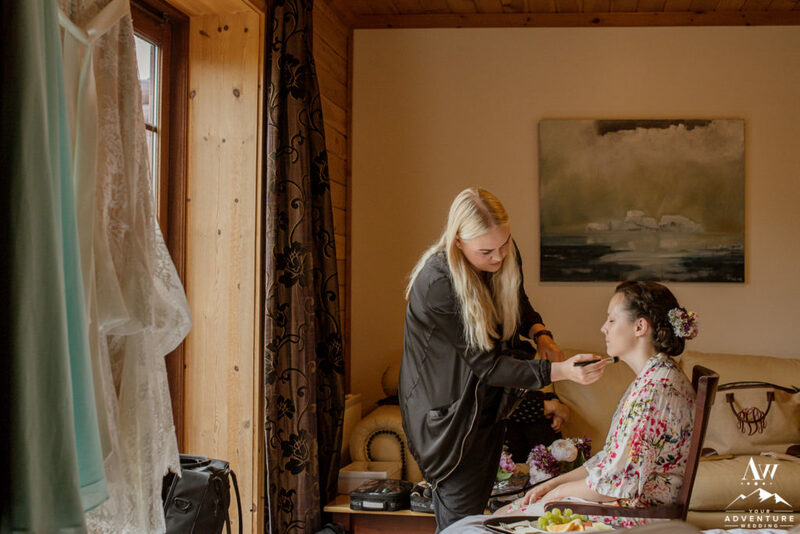 The day began around 5am with our Iceland hair and makeup team coming to their hotel room. 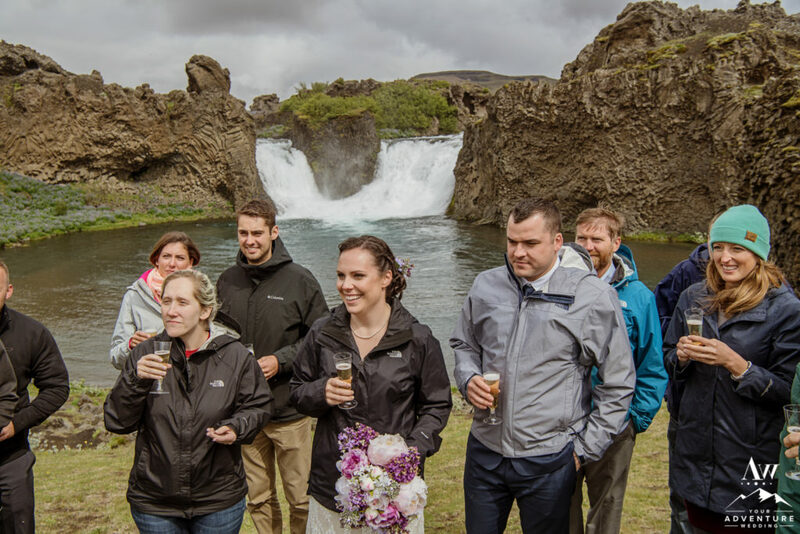 Then around 8am our transportation arrives and we were off to their beautiful waterfall wedding ceremony. 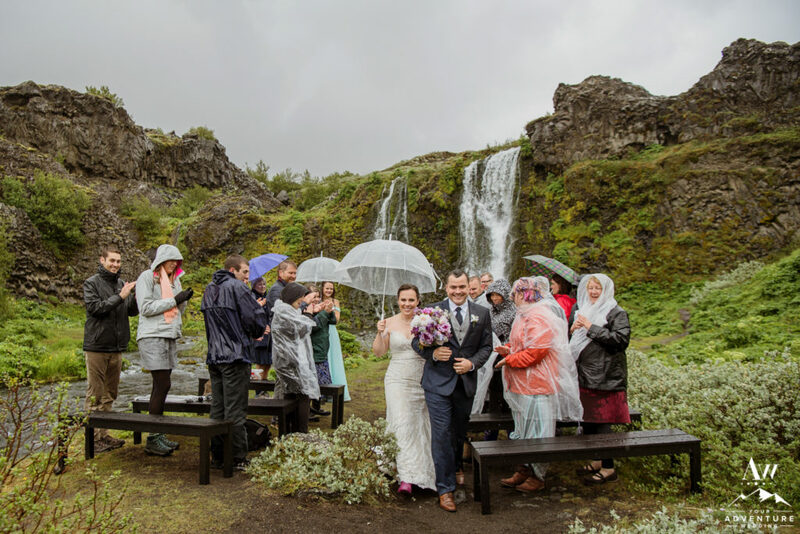 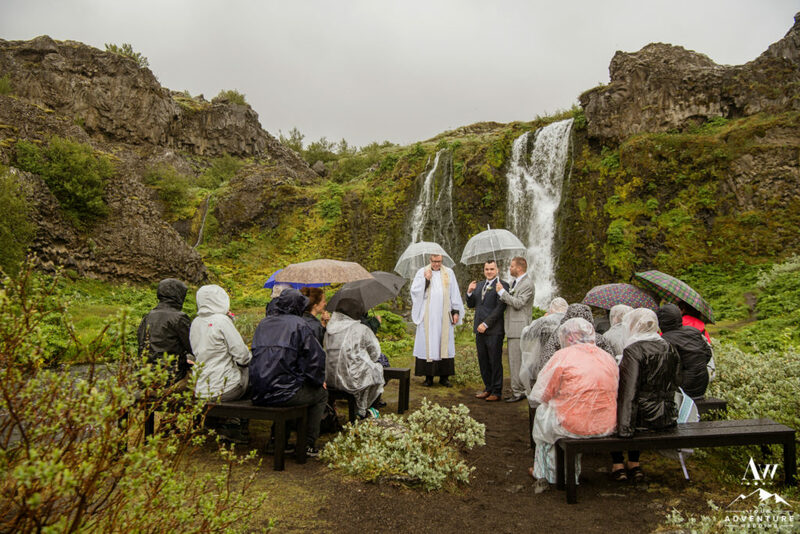 Upon arriving, it was pouring down with rain but the group embraced it, put up their hoods/umbrellas and enjoyed all of what the Icelandic weather had to offer by fully immersing themselves in it. 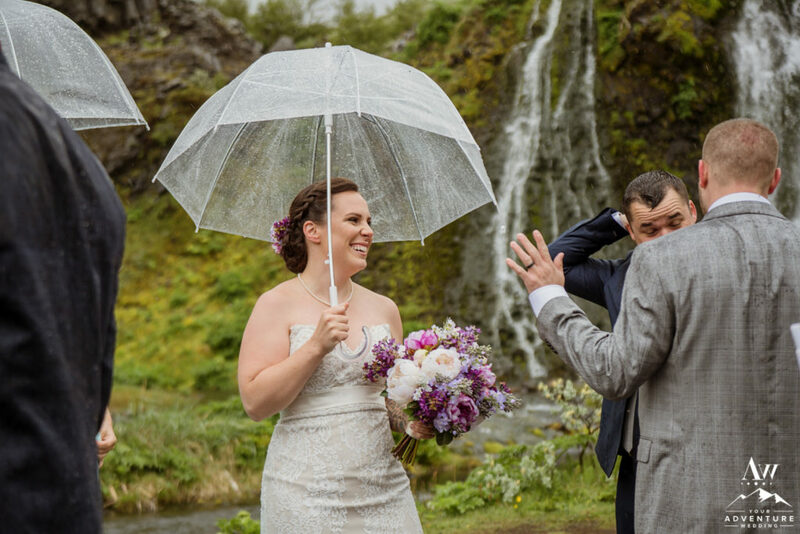 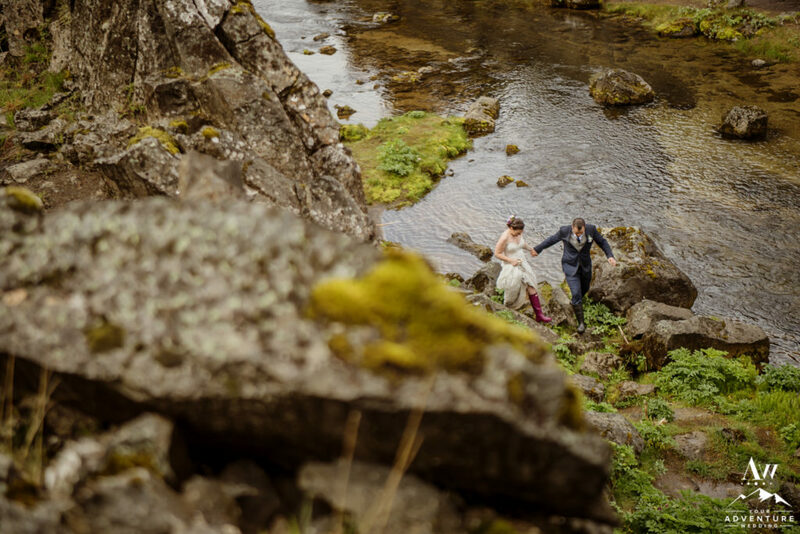 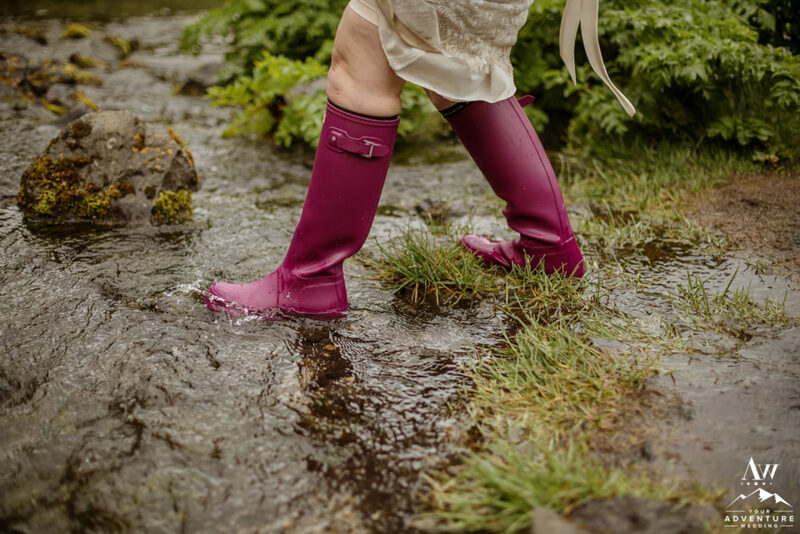 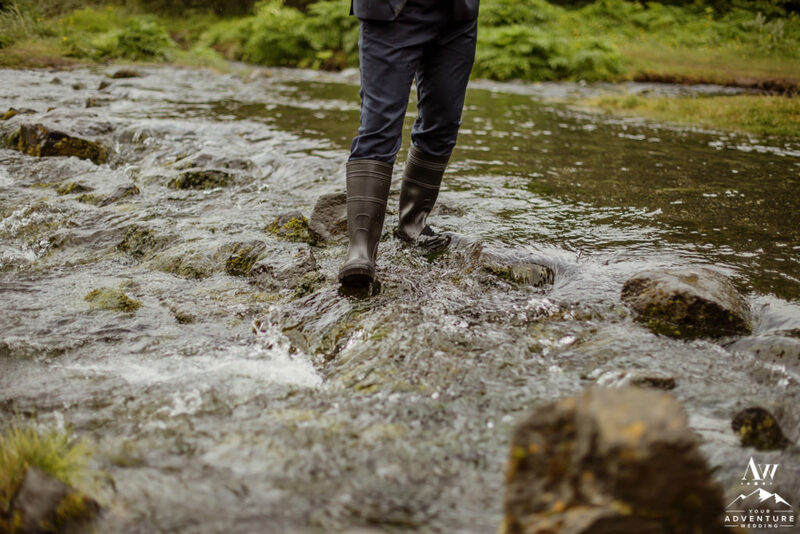 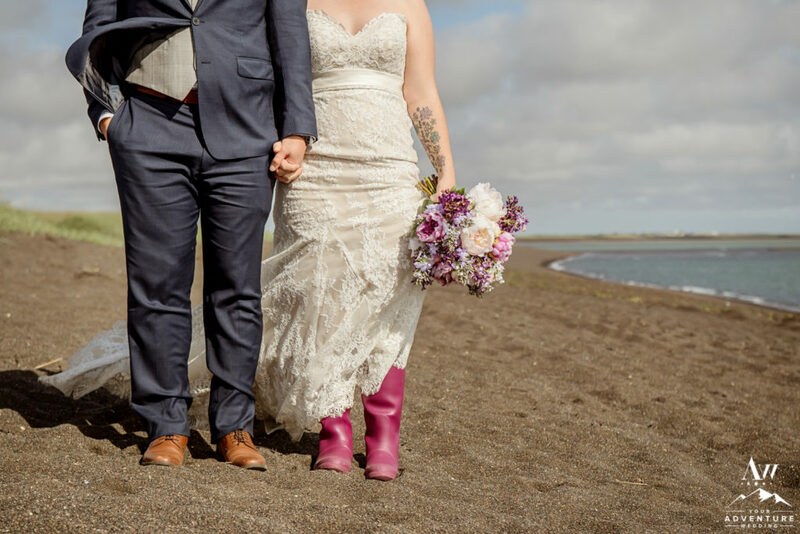 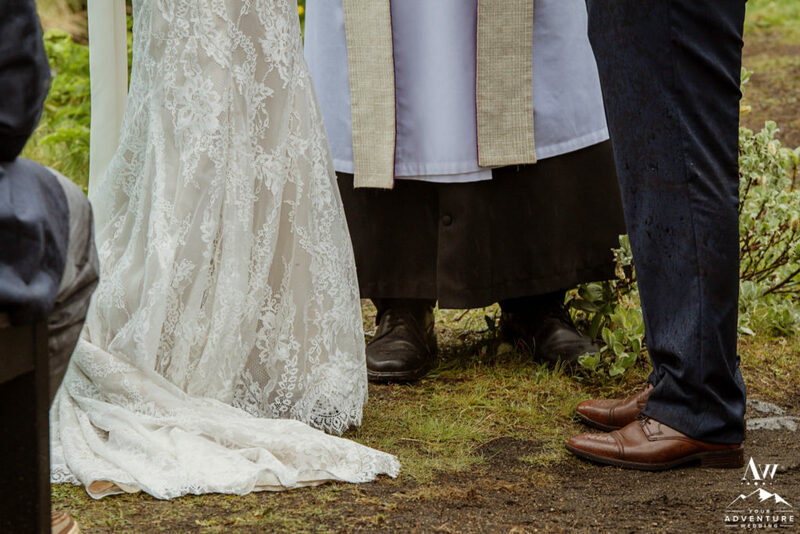 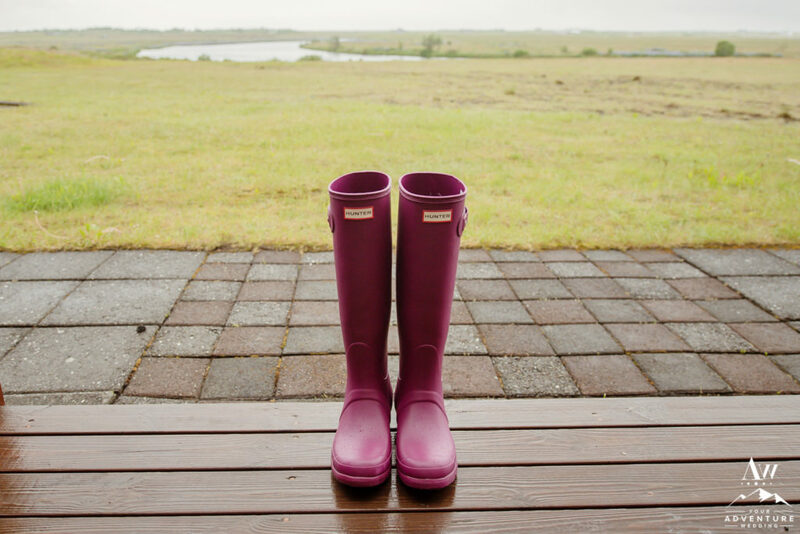 After the ceremony, Rebecca and James put on their waterproof boots and went exploring with their Iceland wedding photographer! 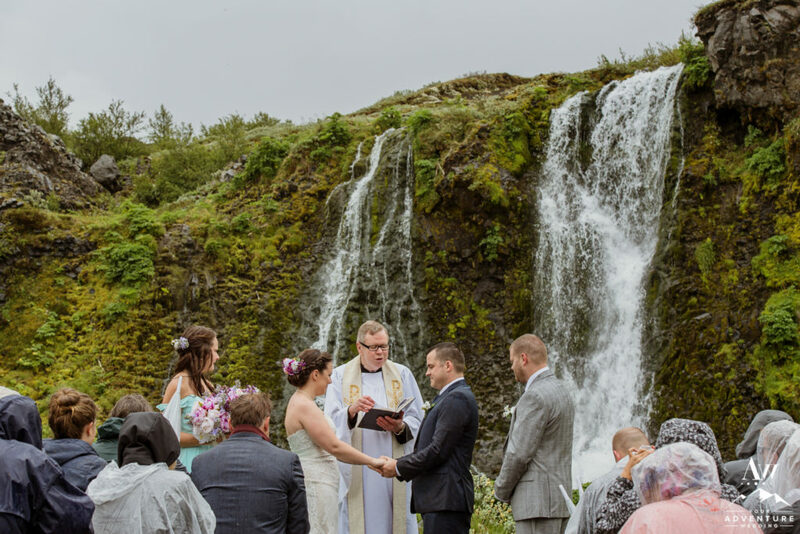 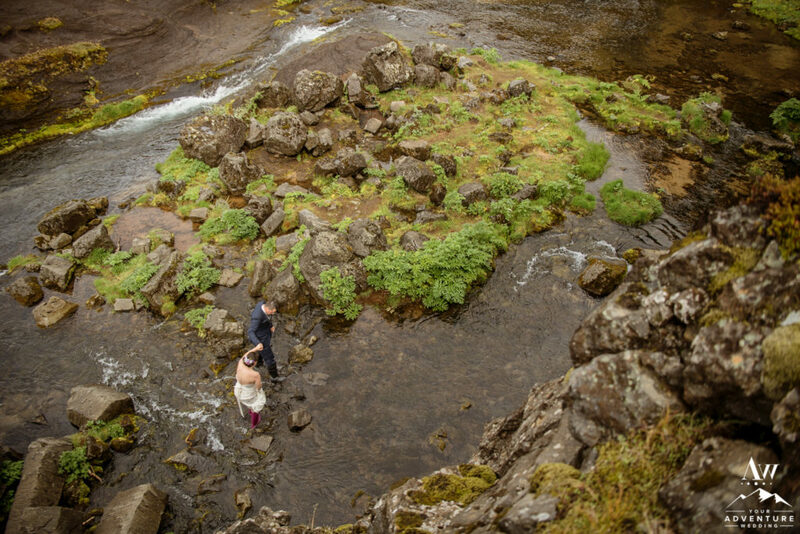 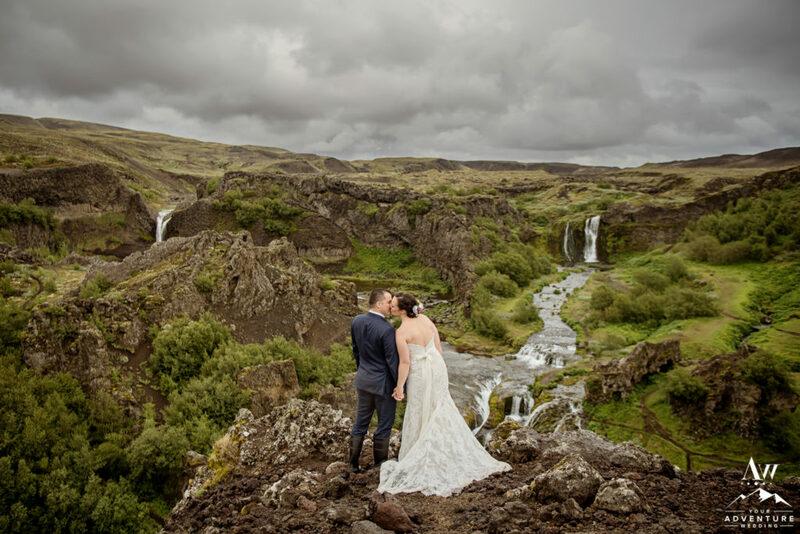 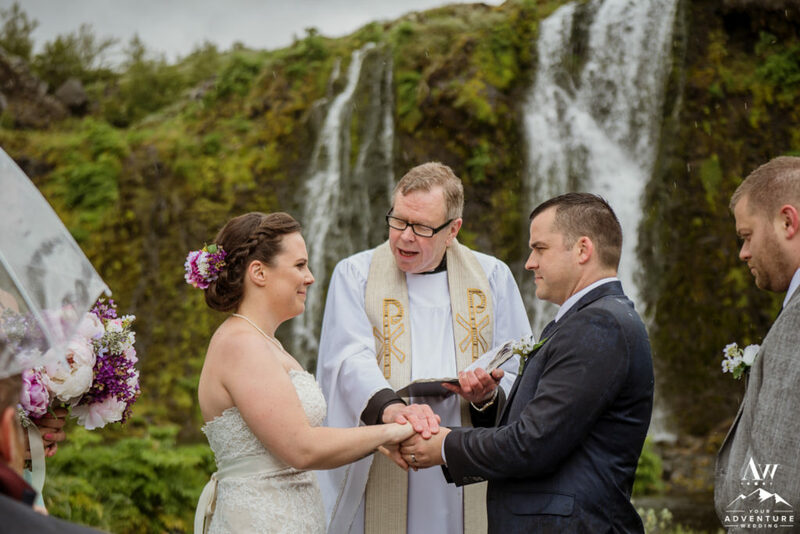 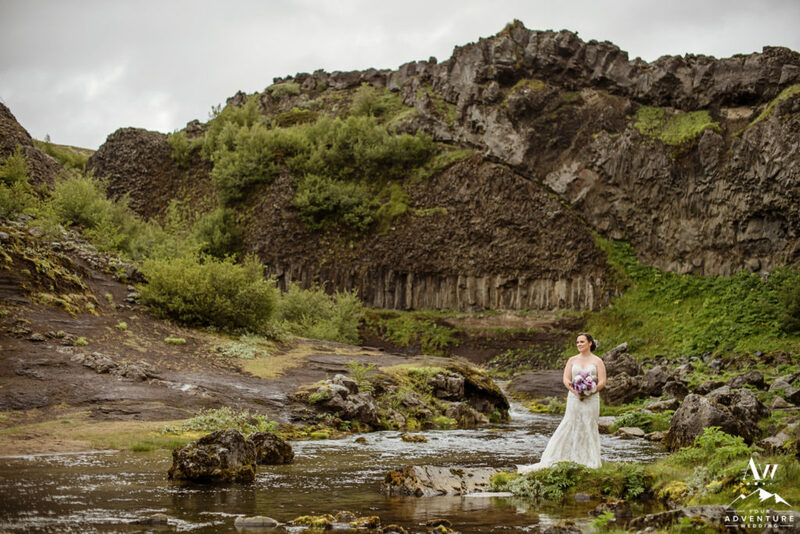 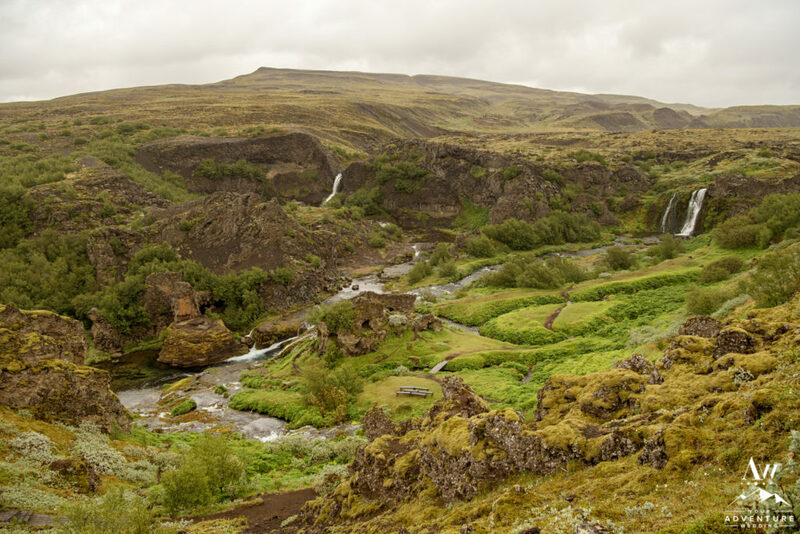 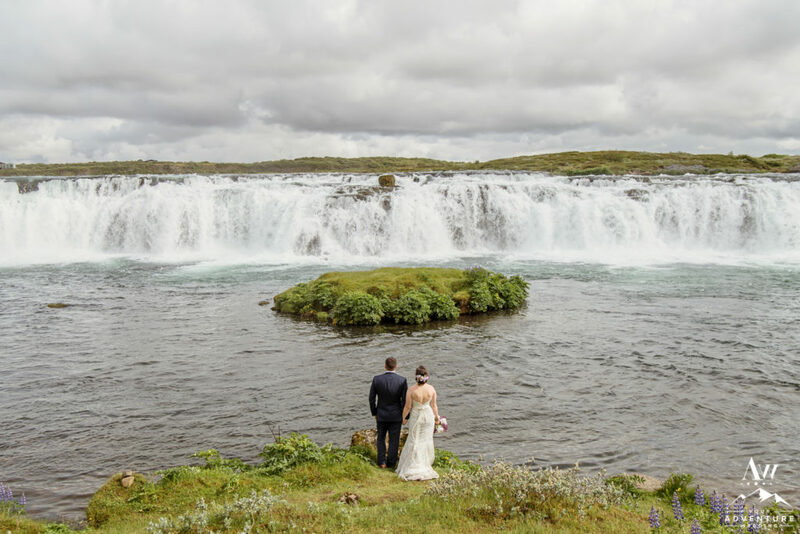 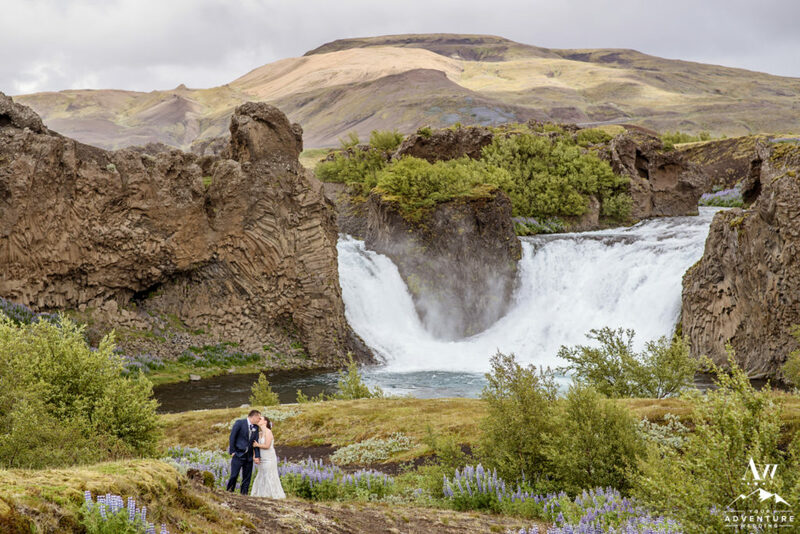 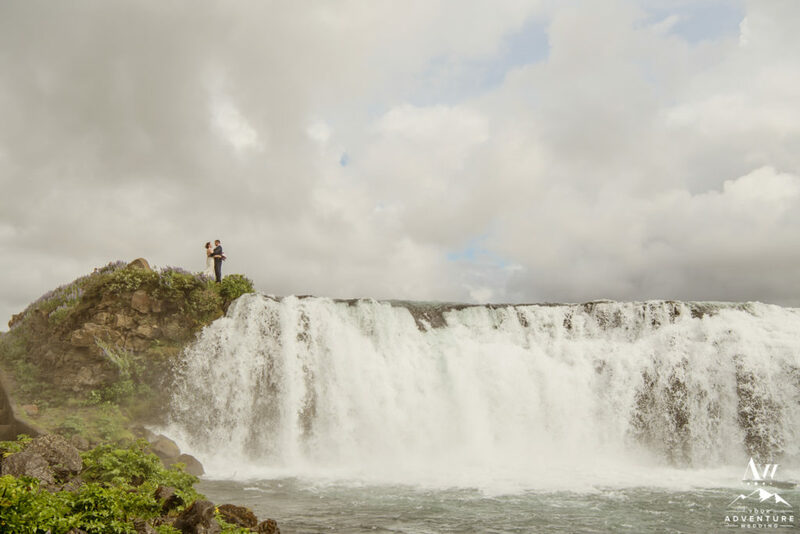 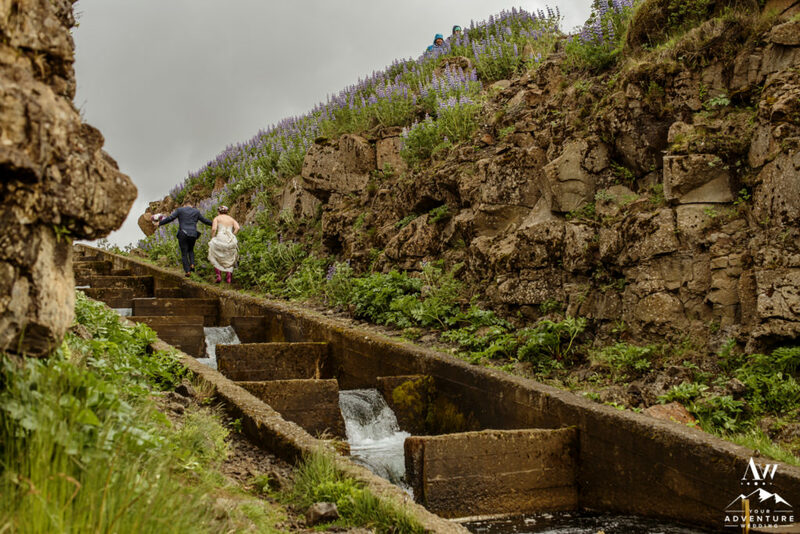 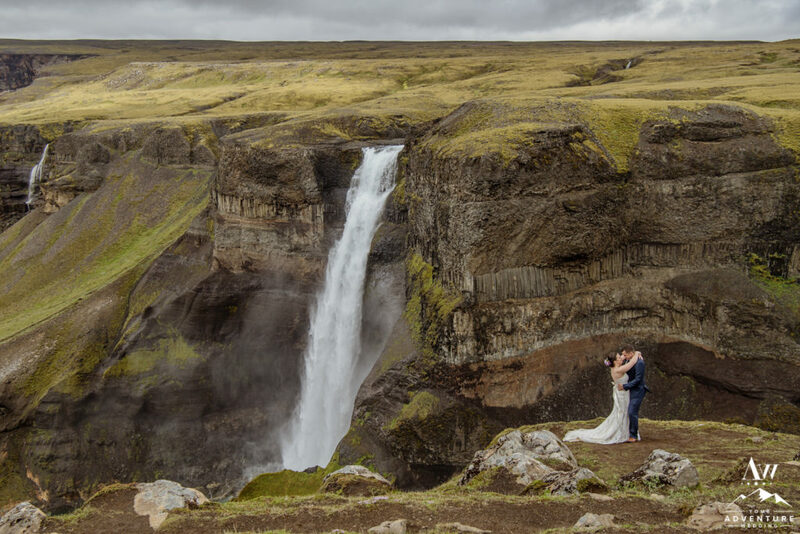 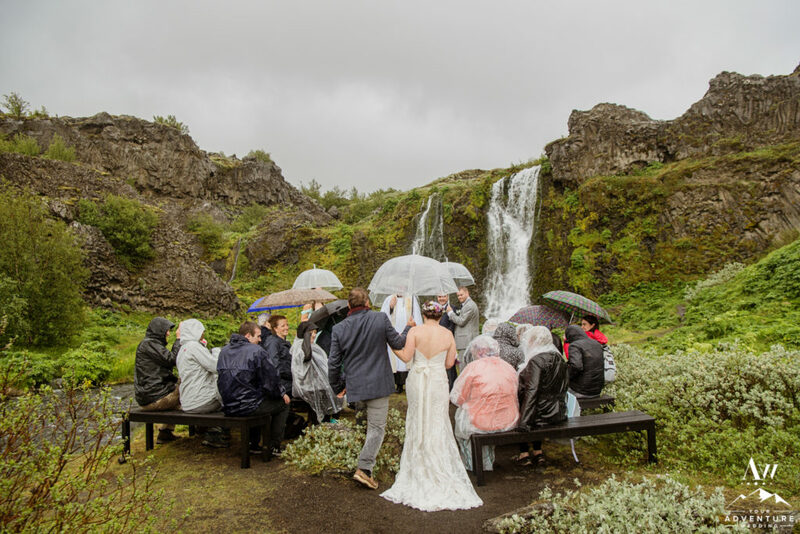 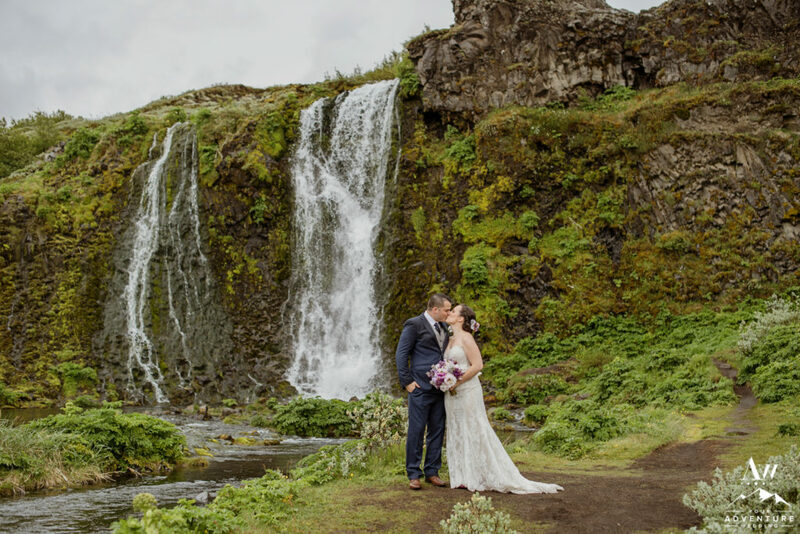 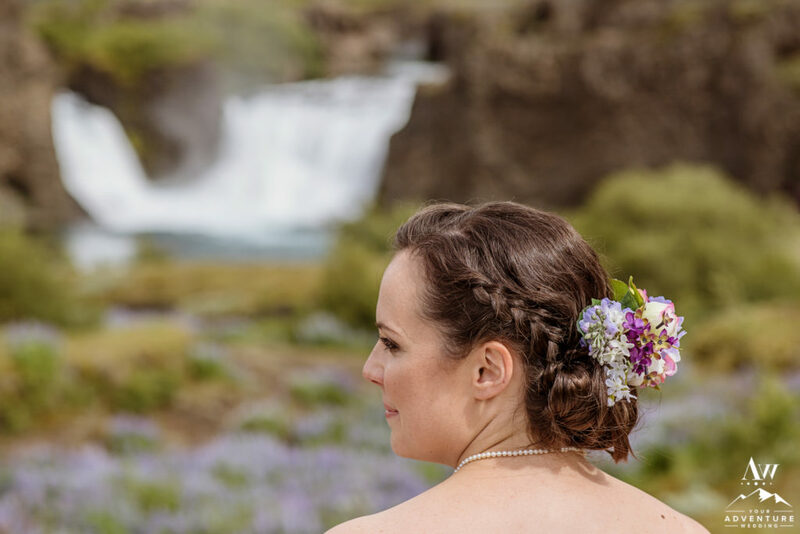 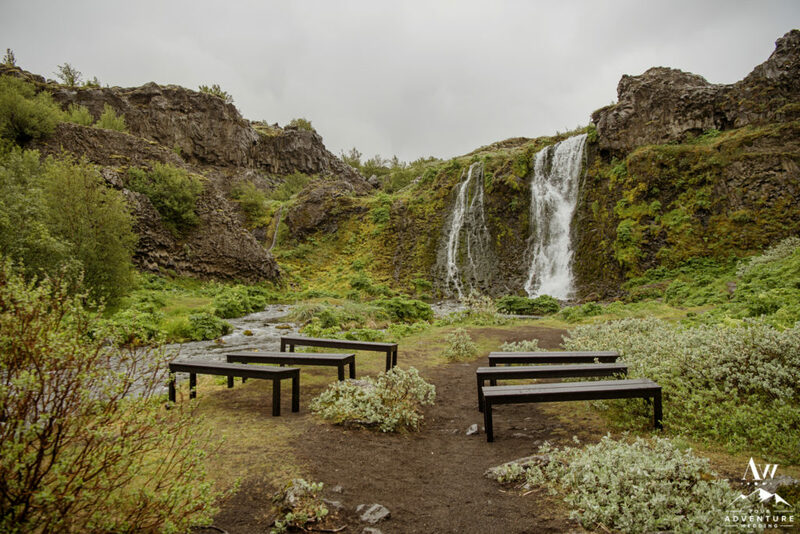 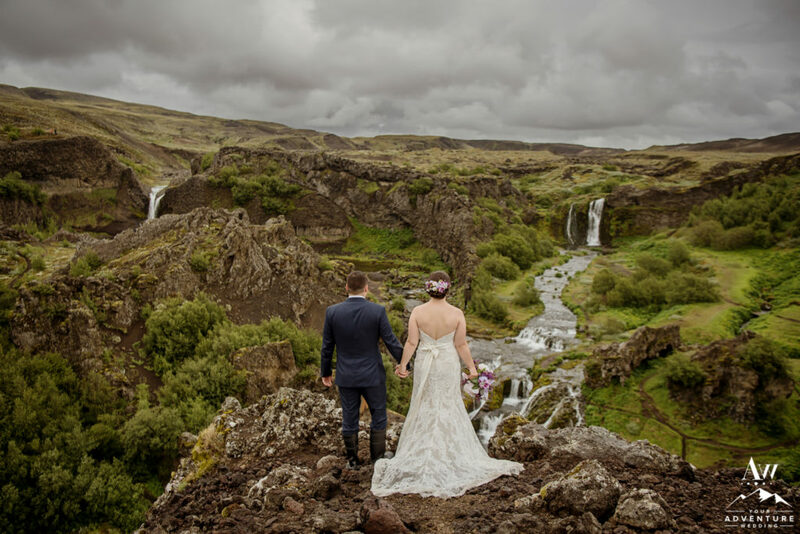 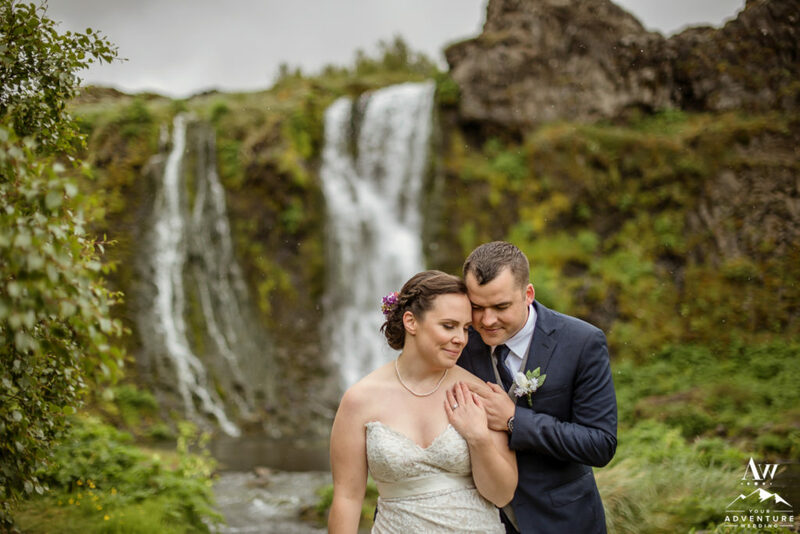 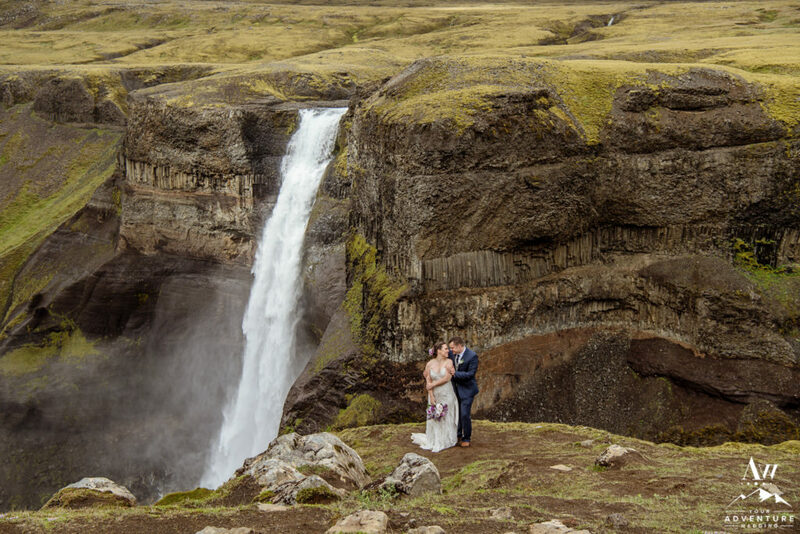 Once that location had been fully explored, we headed on to 3 more offbeat waterfalls in the highlands for more exploration and Iceland wedding photos! 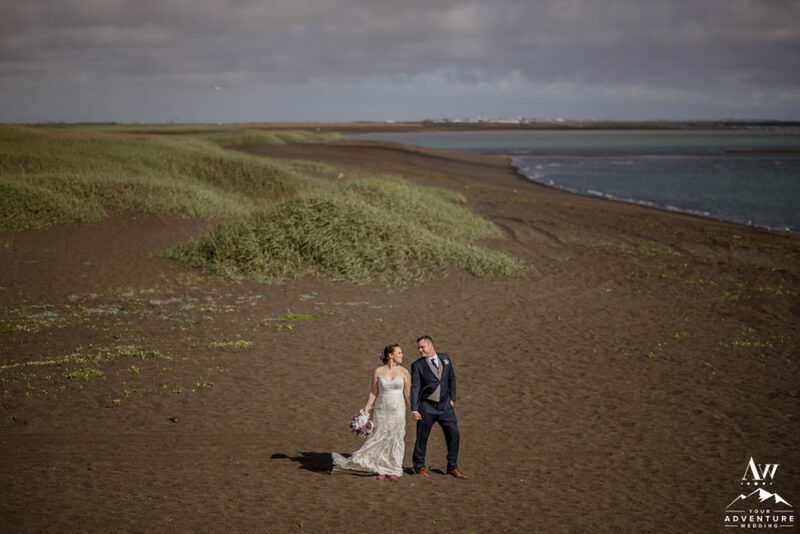 The adventure concluded at a lovely black sand beach where the group explored by themselves in the sunshine! 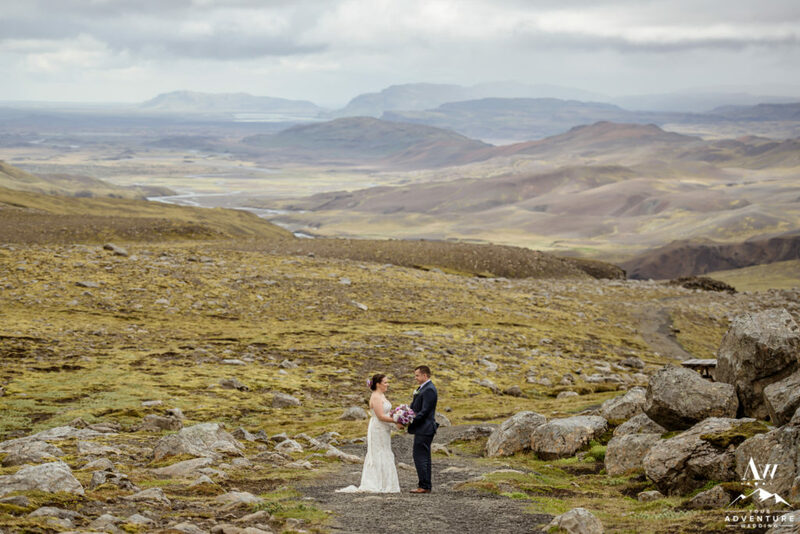 It in the end, turned into quite the stunning day! 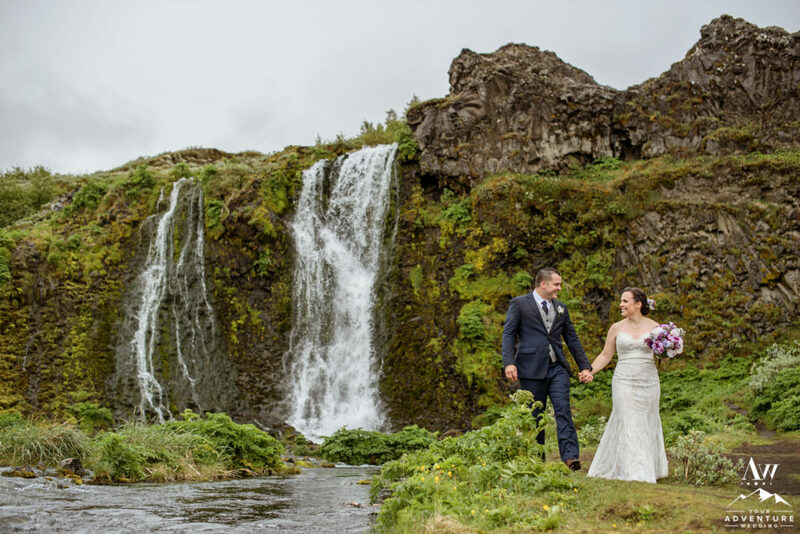 We are firm believers that after an adventure wedding in Iceland the couple and guests need a little rest and refresh time. 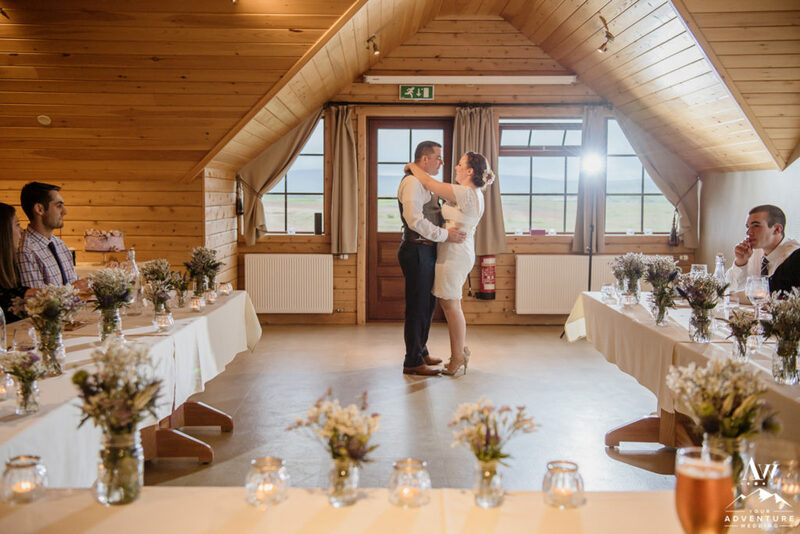 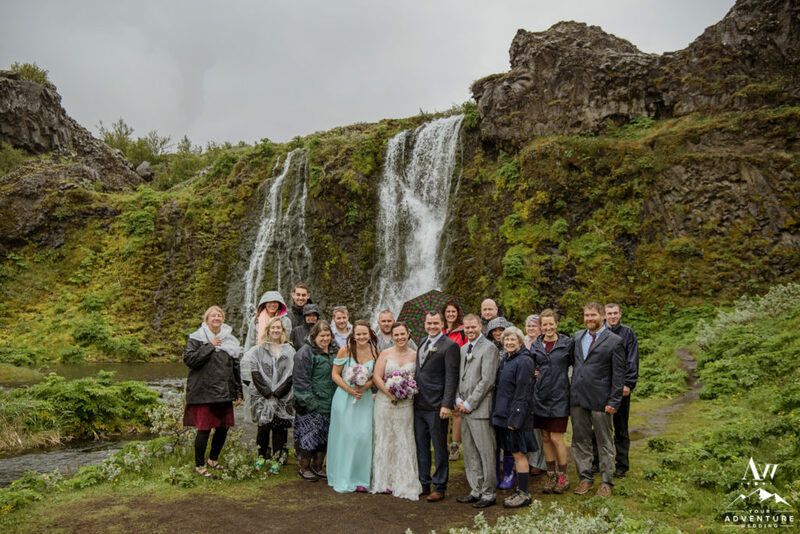 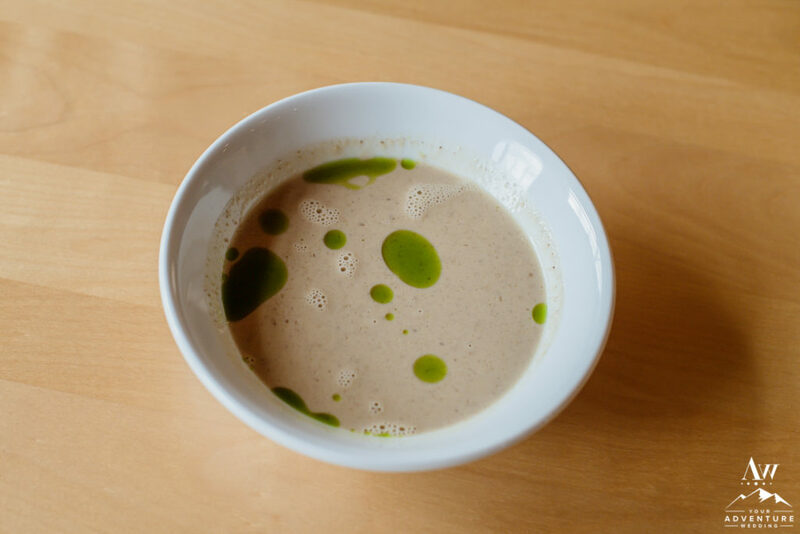 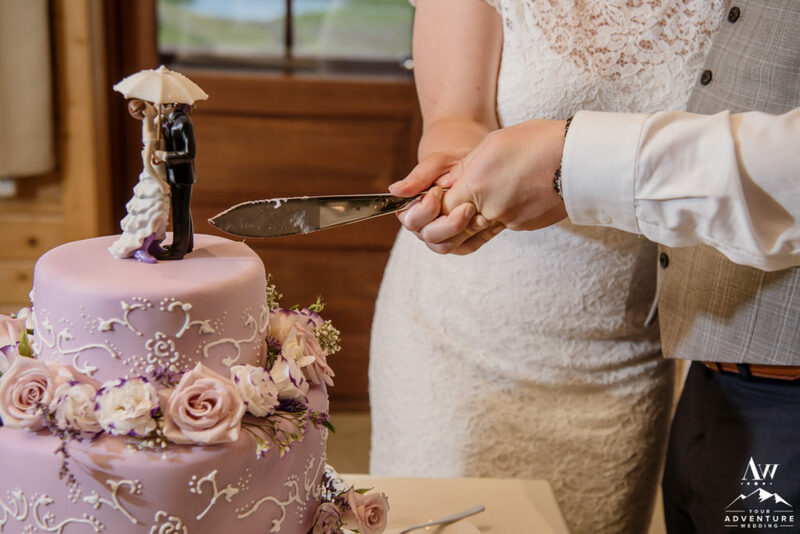 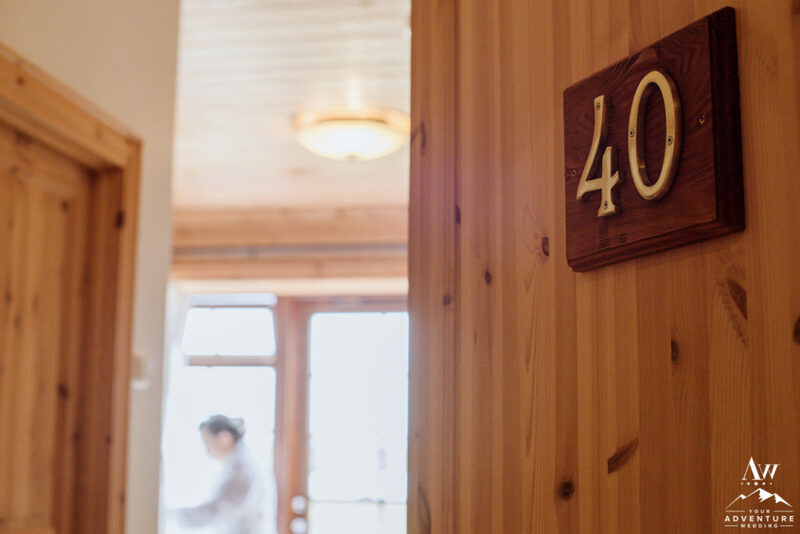 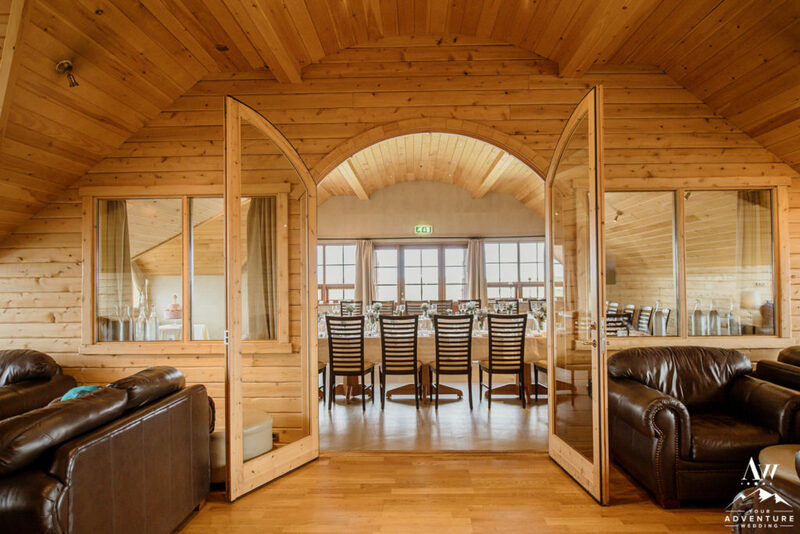 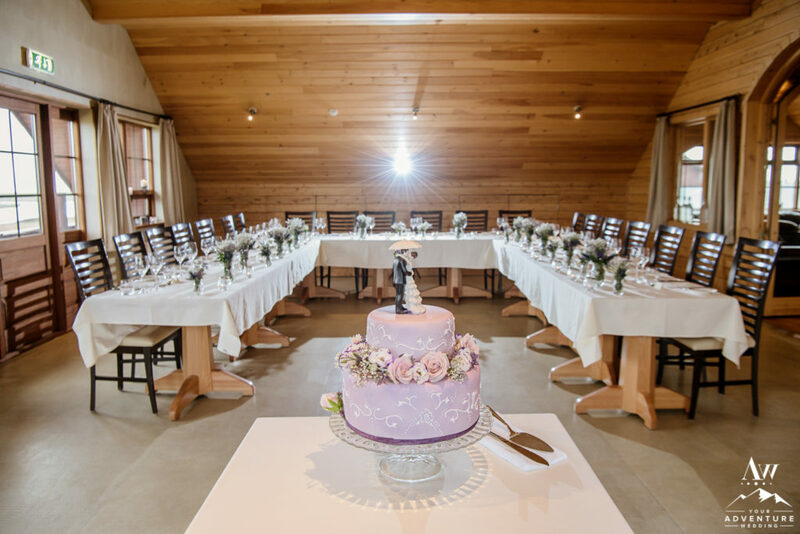 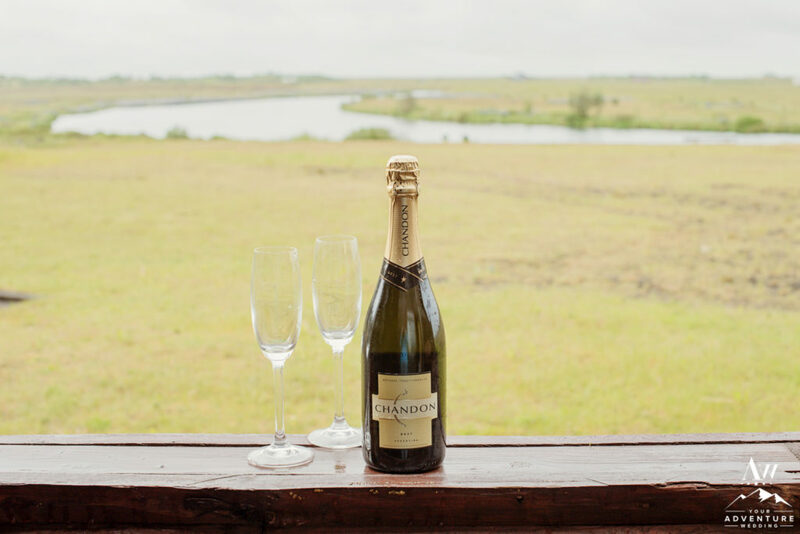 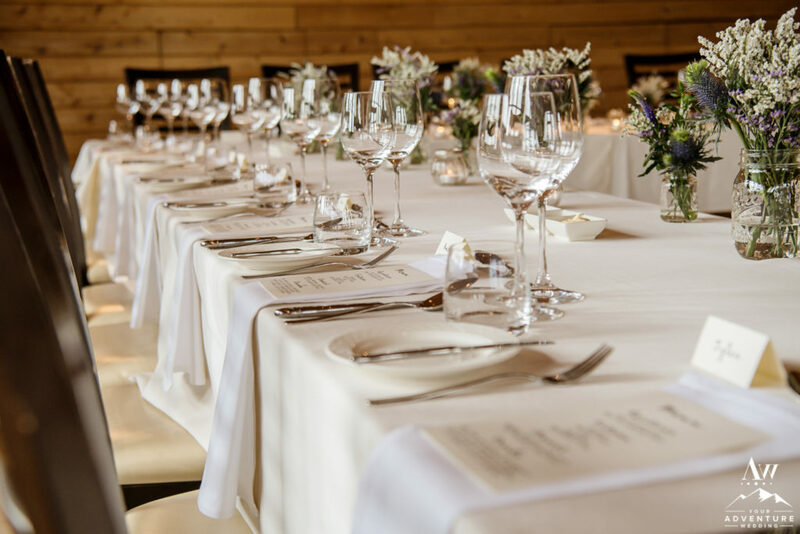 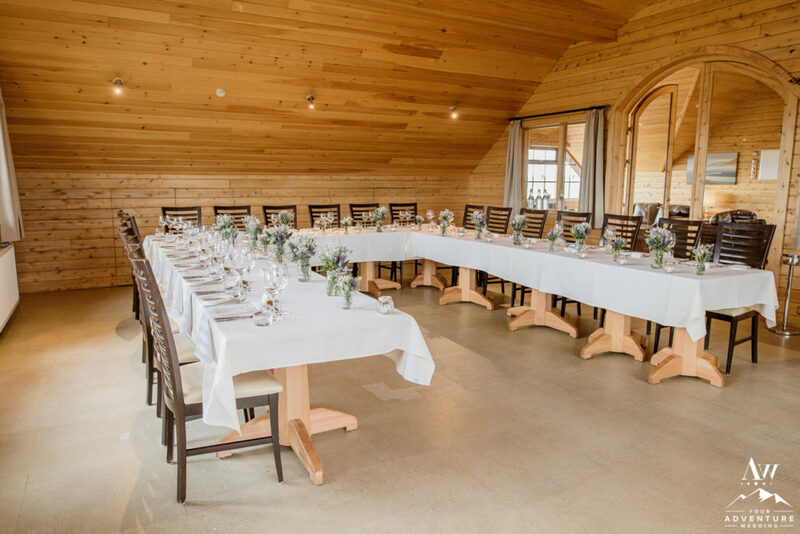 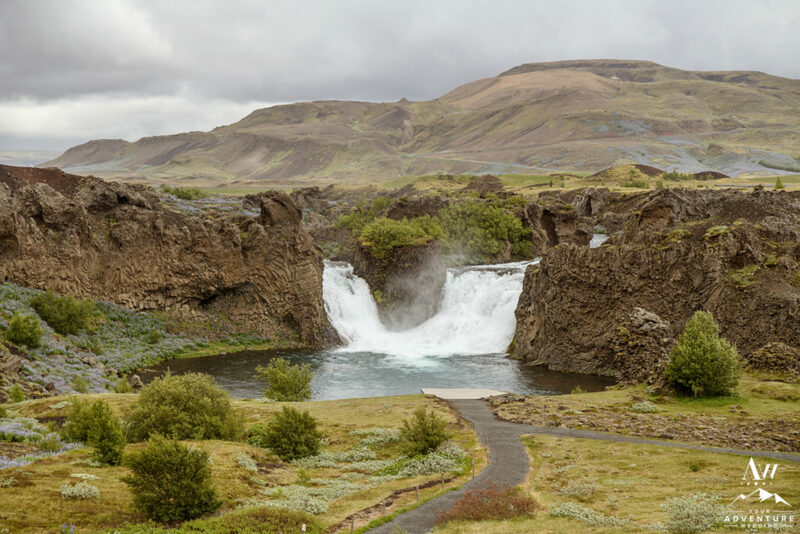 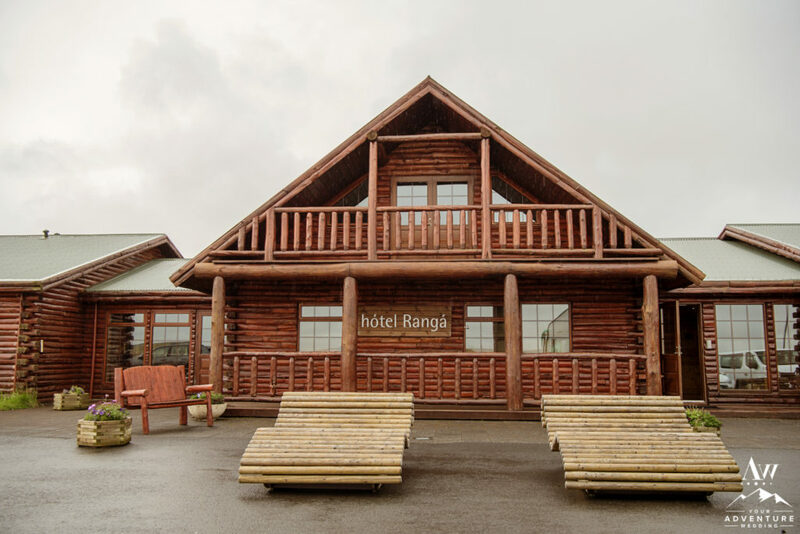 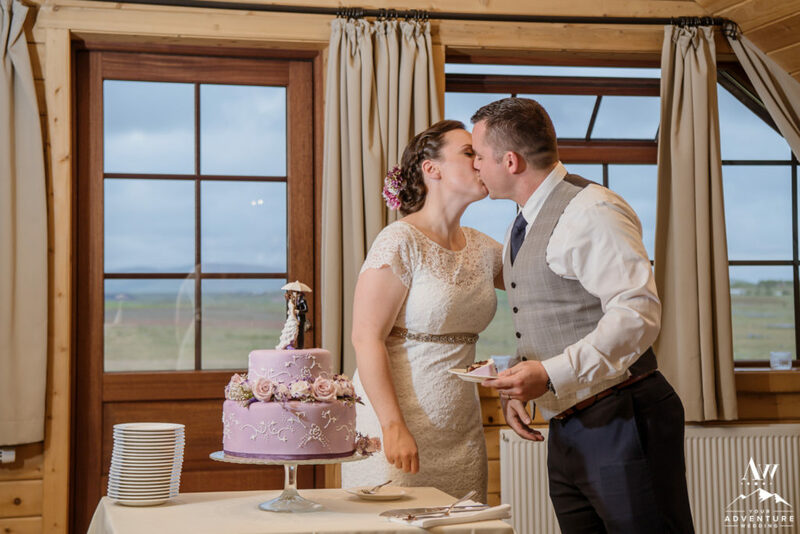 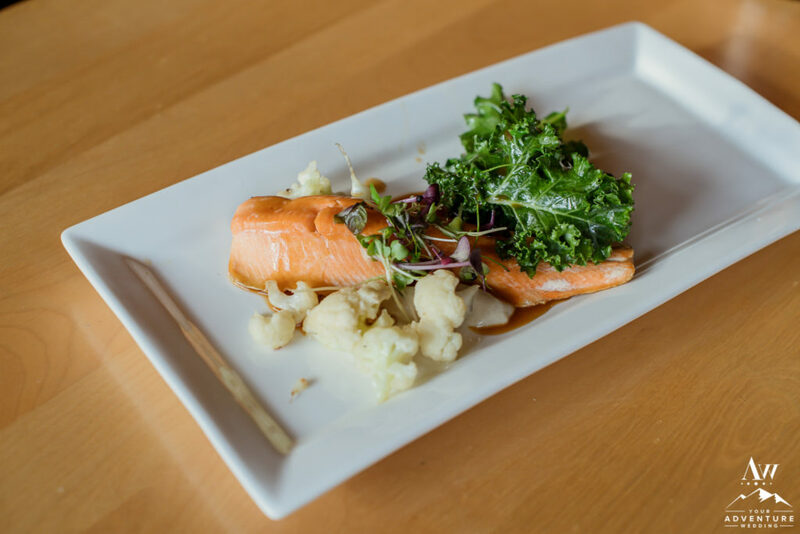 So once the group delighted in that time, they were invited back to River Hall at Hotel Ranga to enjoy a delicious 3 course Iceland wedding meal. 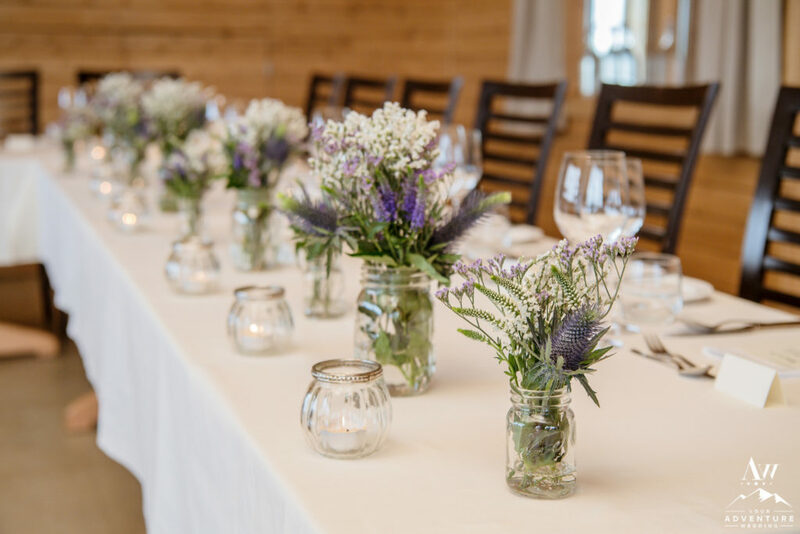 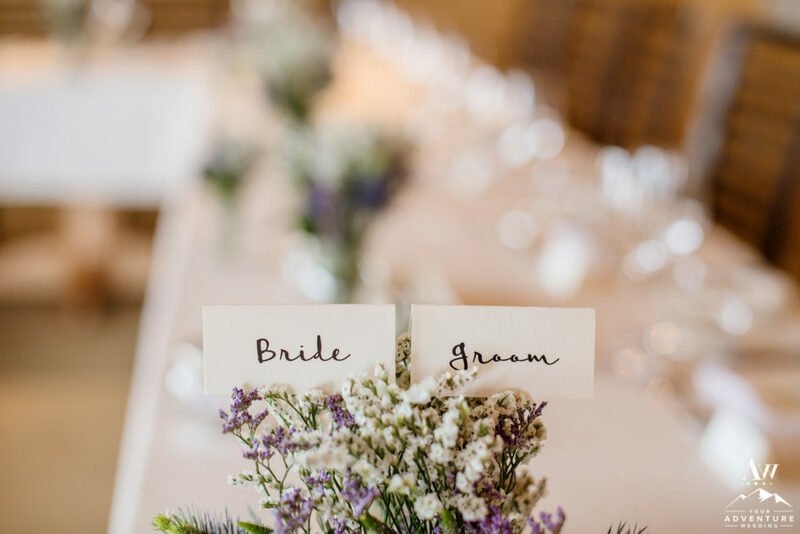 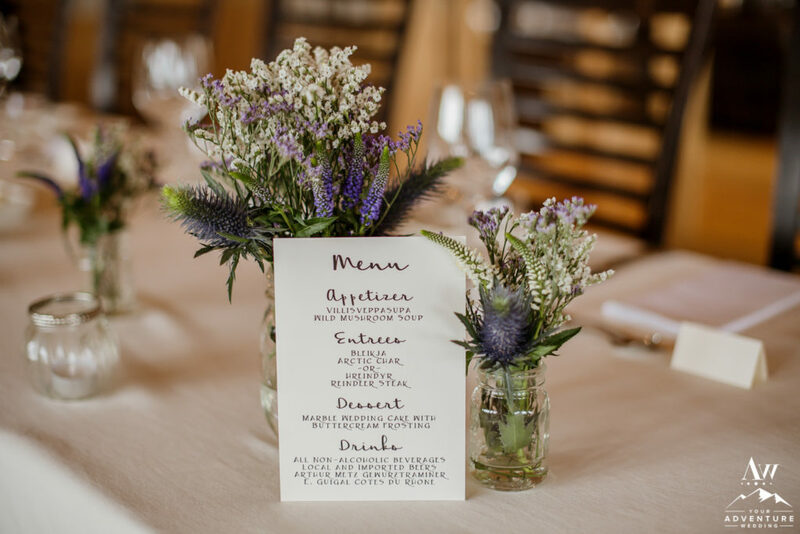 As you will see there were intimate details the guests enjoyed like the wild flowers, menus, and the ambiance the candles brought overlooking the beautiful Ranga River! 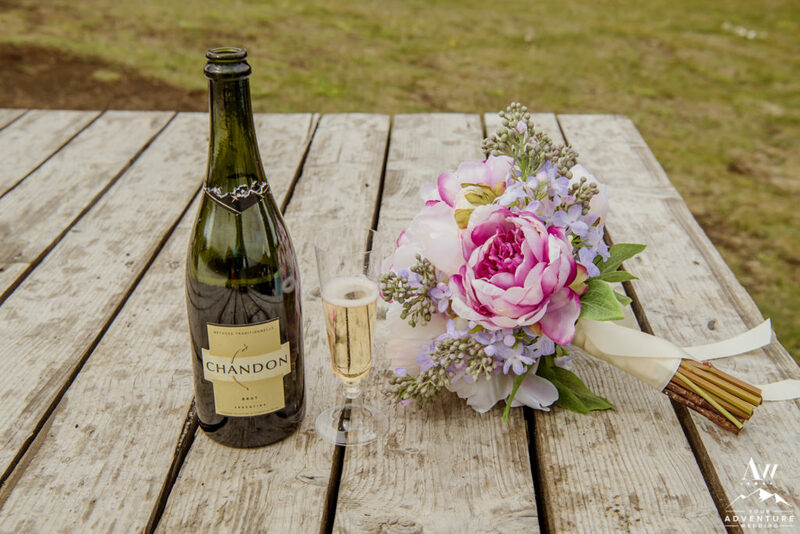 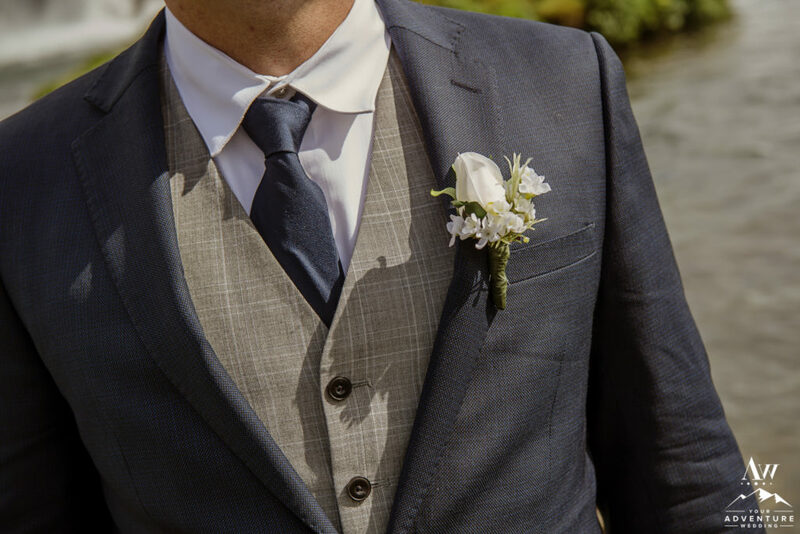 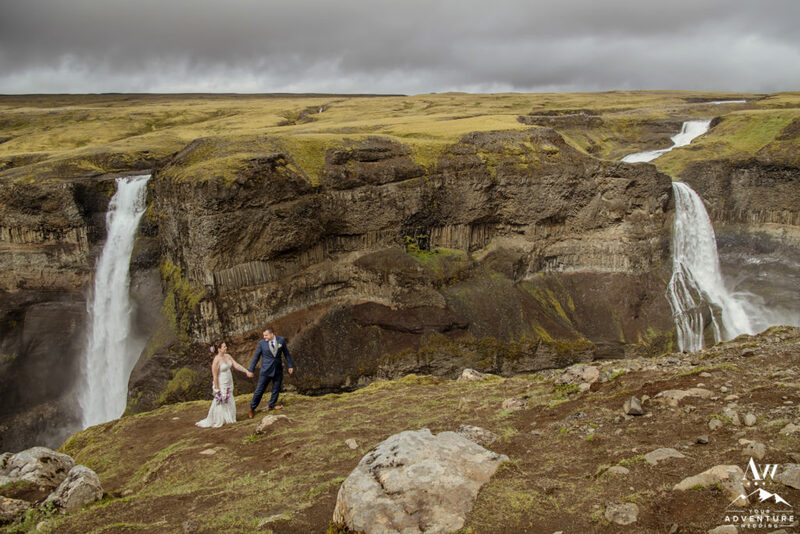 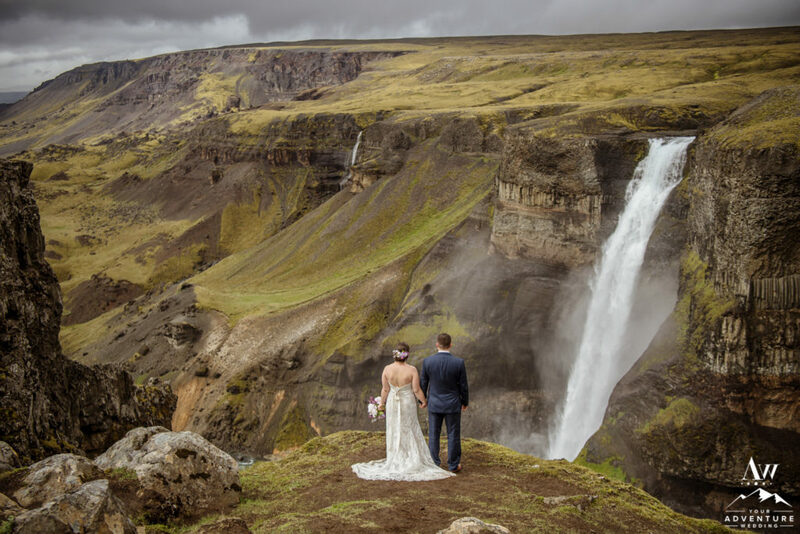 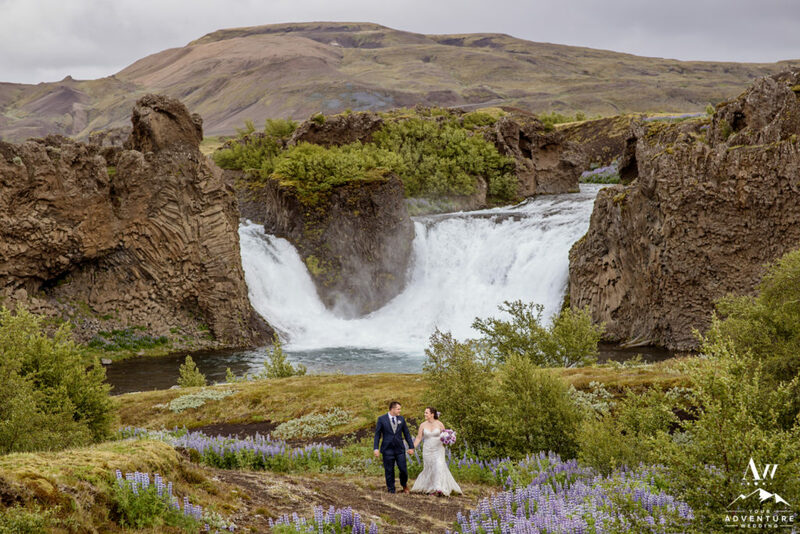 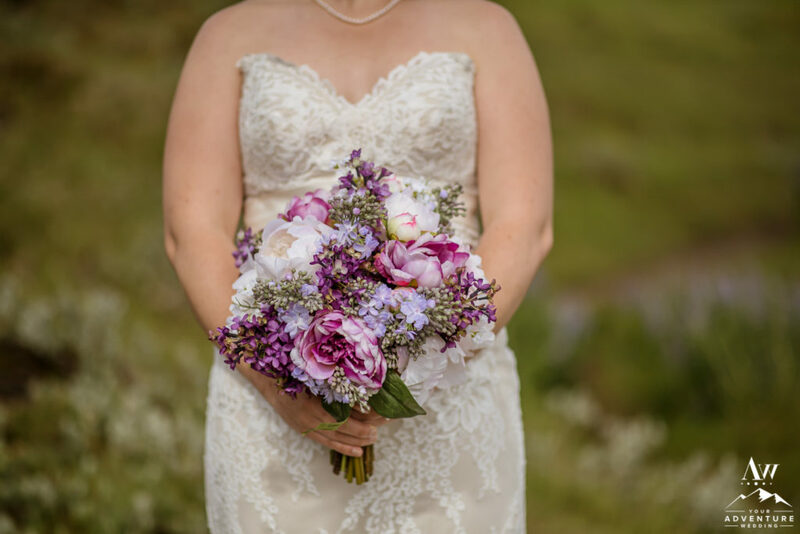 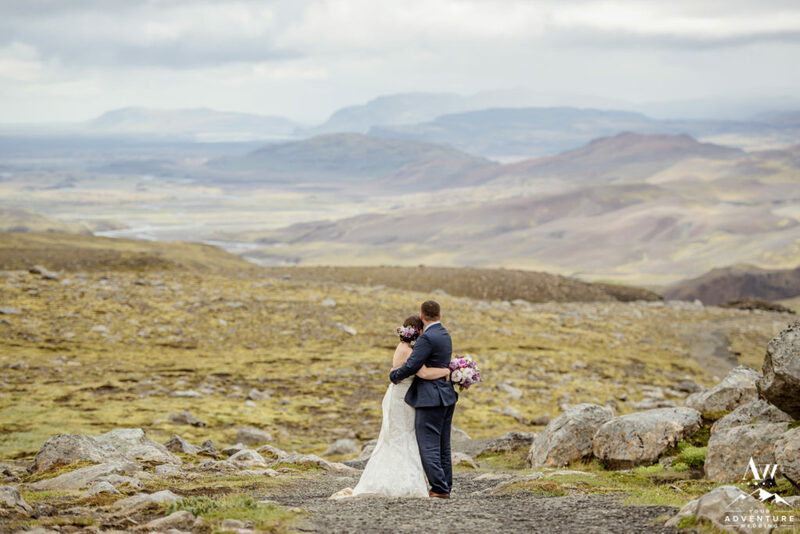 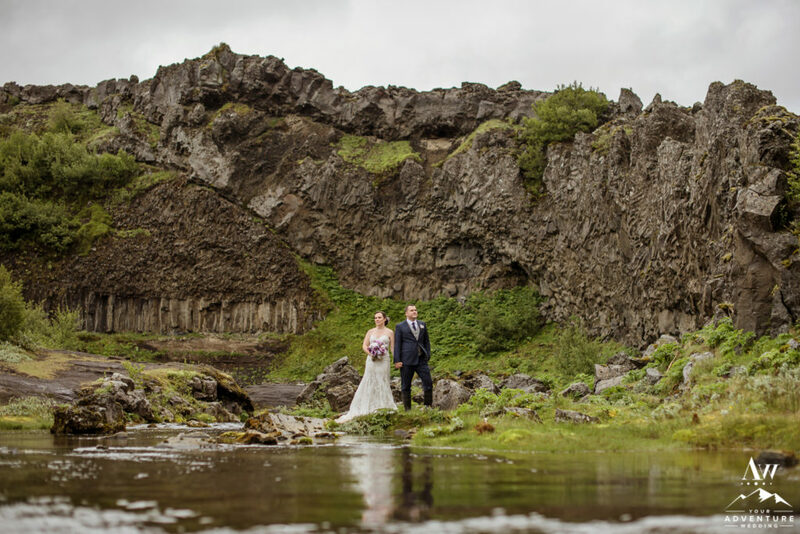 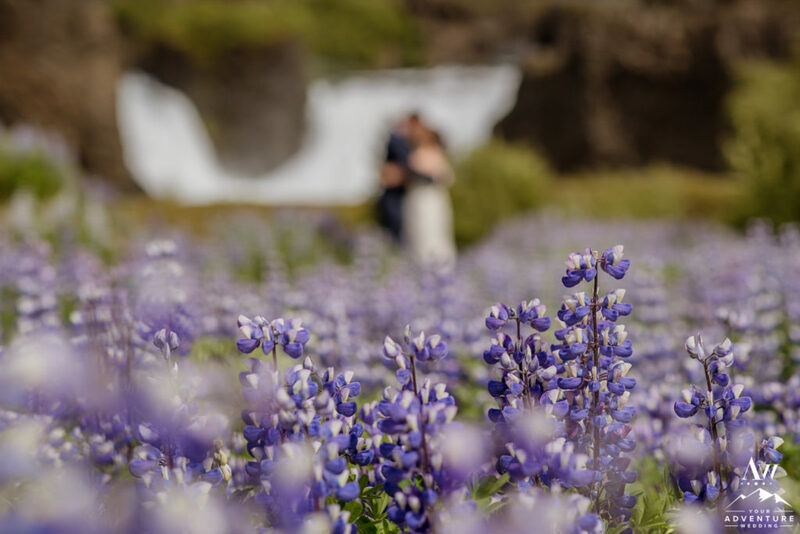 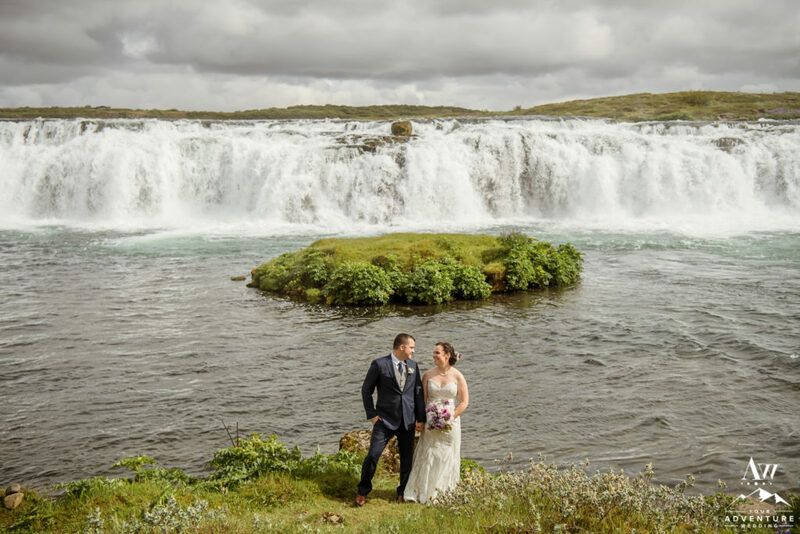 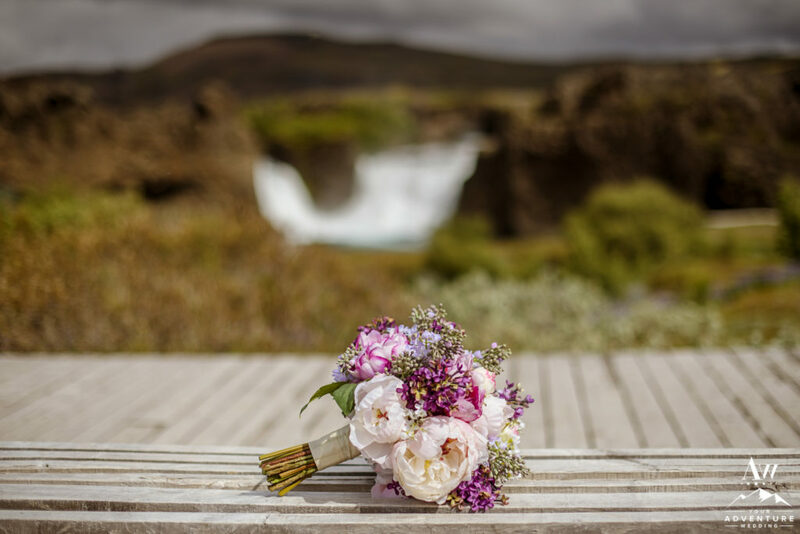 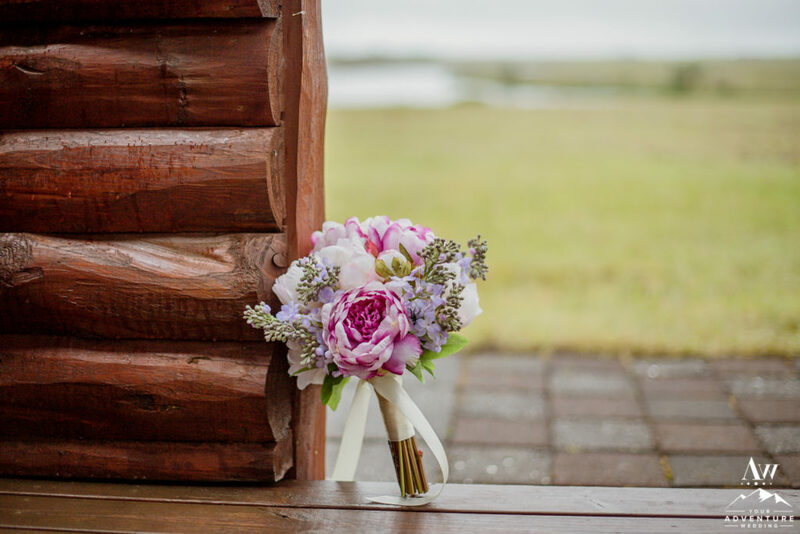 Our Iceland Wedding Planner team is super excited to share with you today their stunning Iceland adventure wedding day, enjoy! 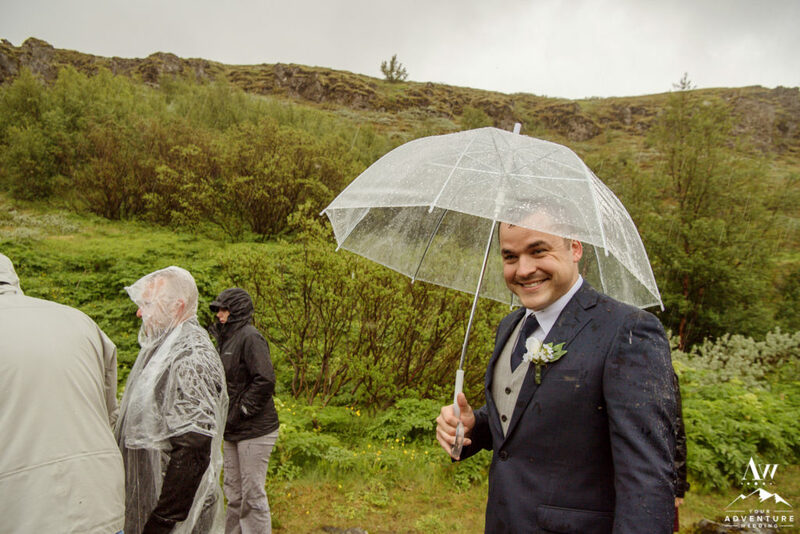 Your smiles, love, and laughter still resonates with us. 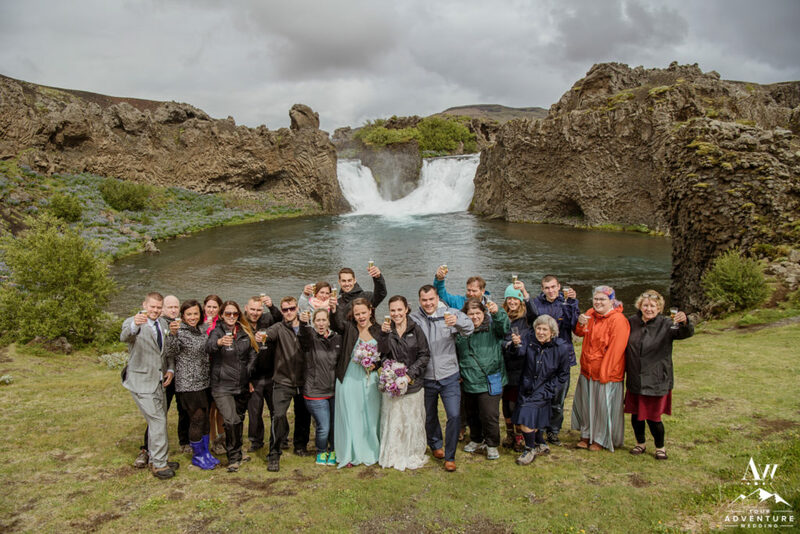 Thank you for sharing this amazing milestone of your lives with us! 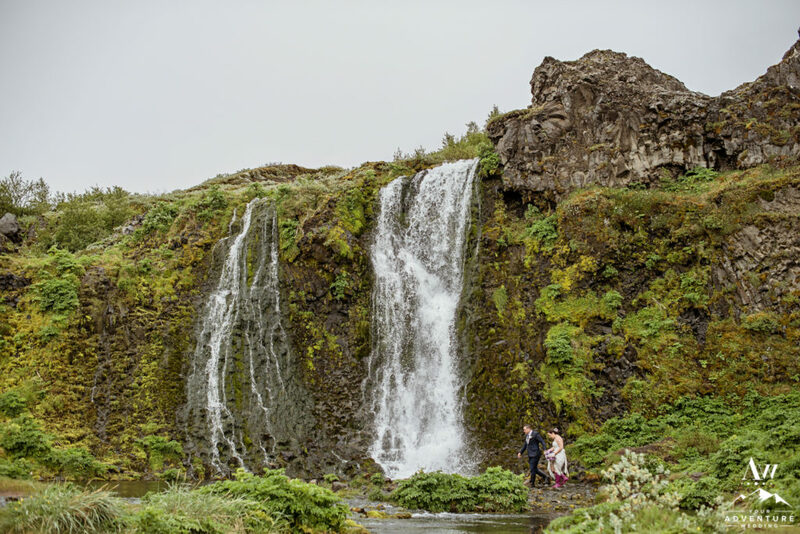 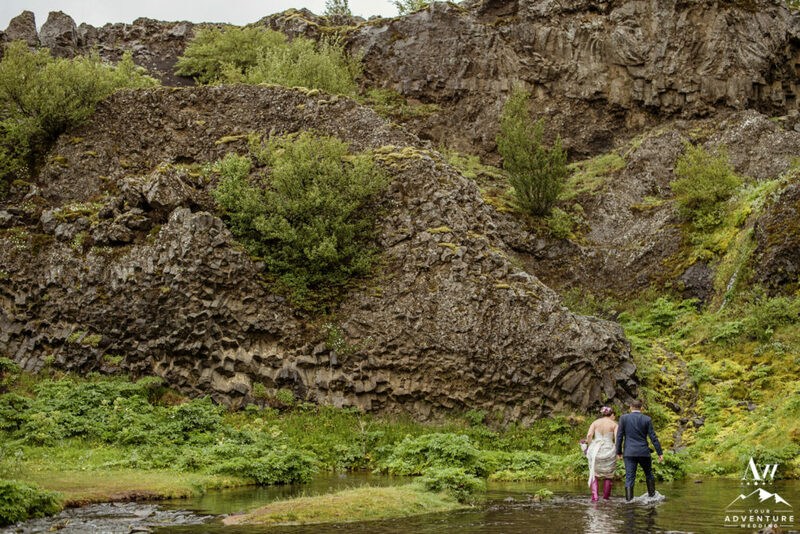 We hope the memory of your Iceland wedding day will be one that continues to bring you an endless amount of joy. 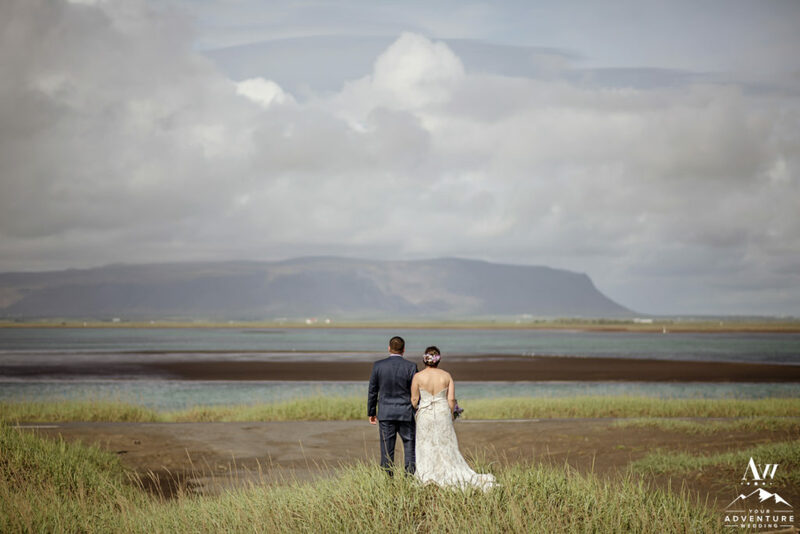 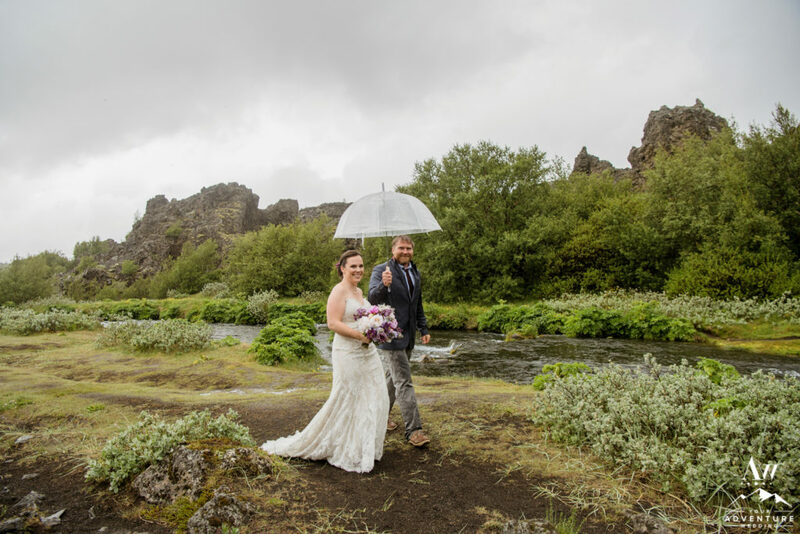 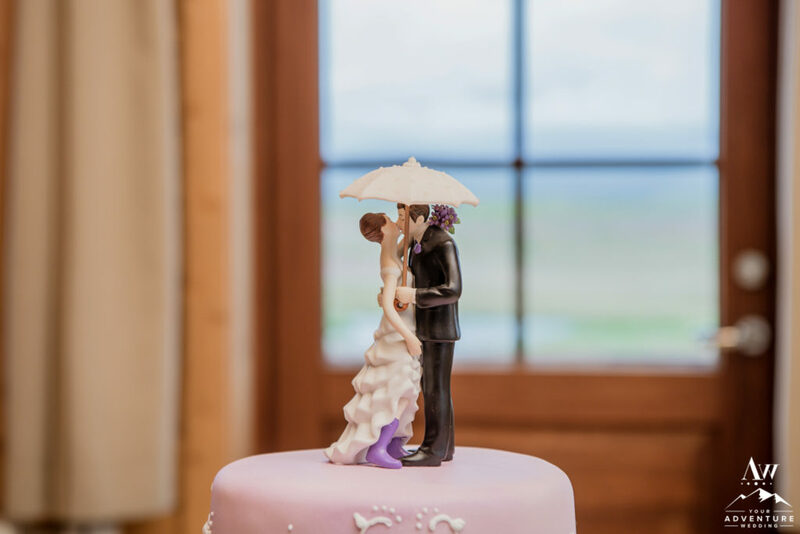 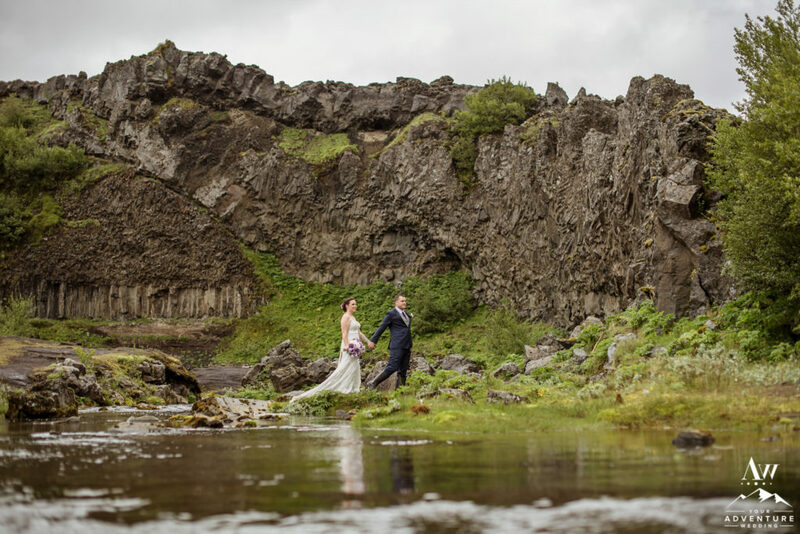 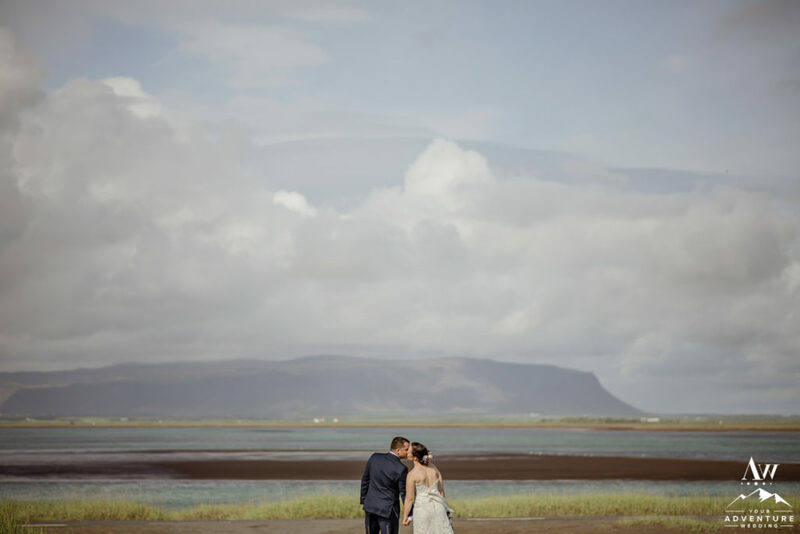 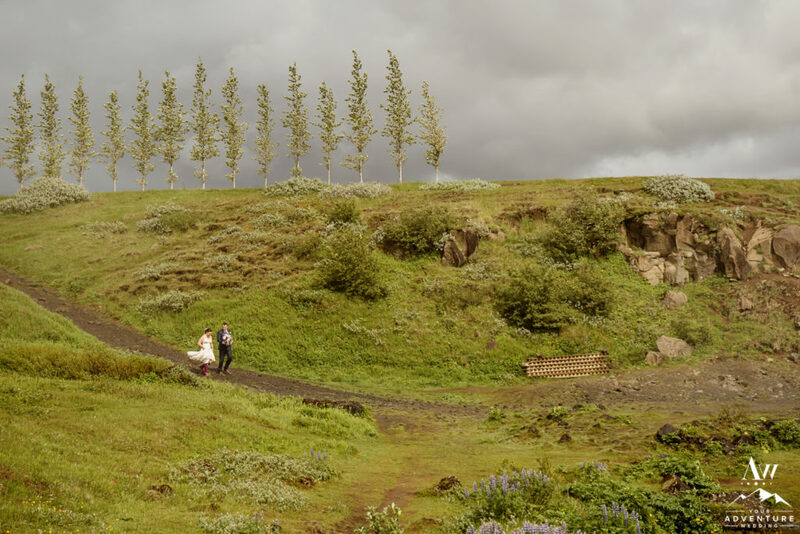 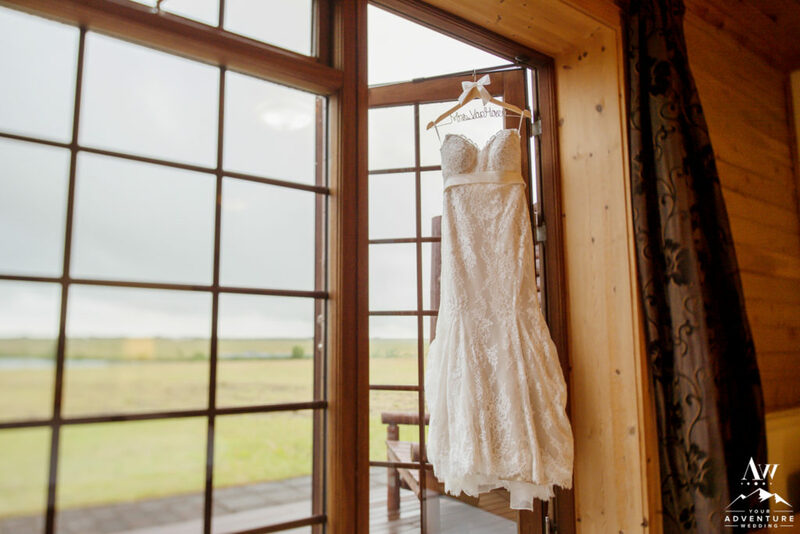 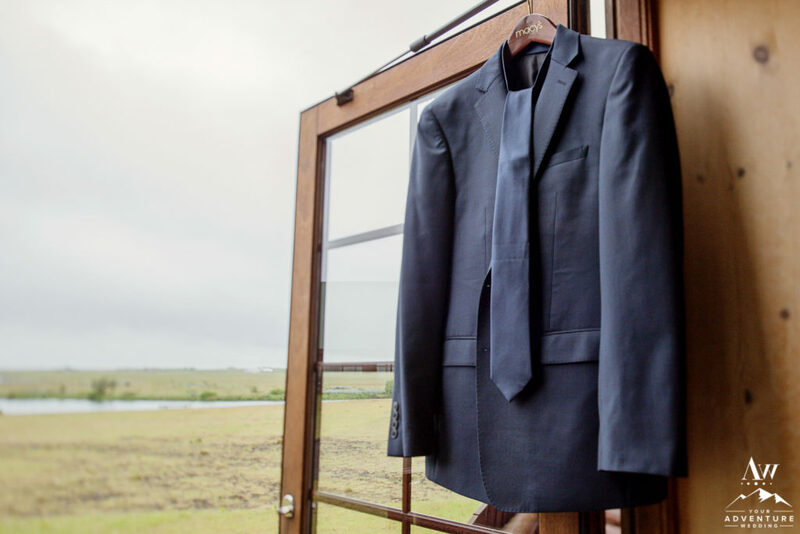 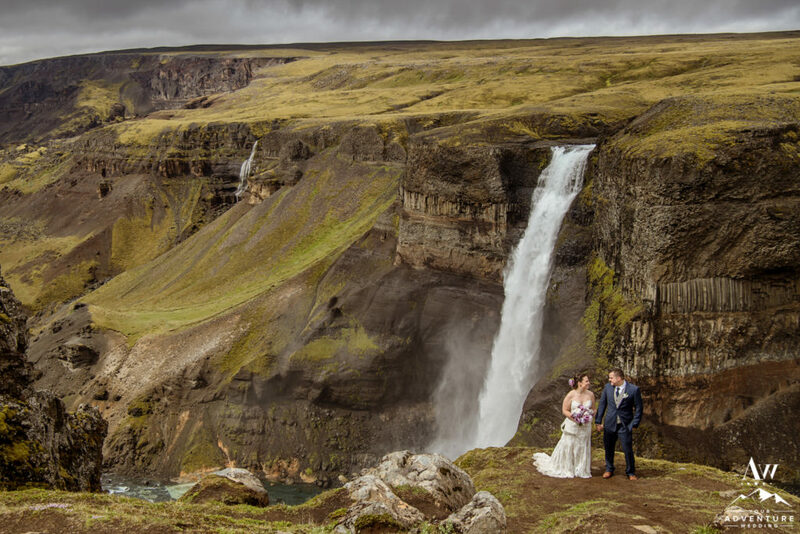 Here’s to also these Iceland wedding photographs also allow you to continuously relive your epic adventure wedding day! 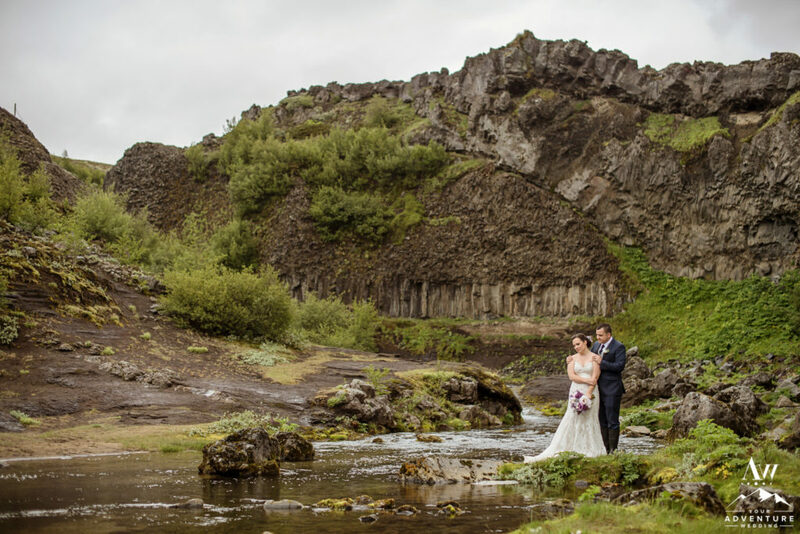 We are happy to welcome you back to Iceland year after year!